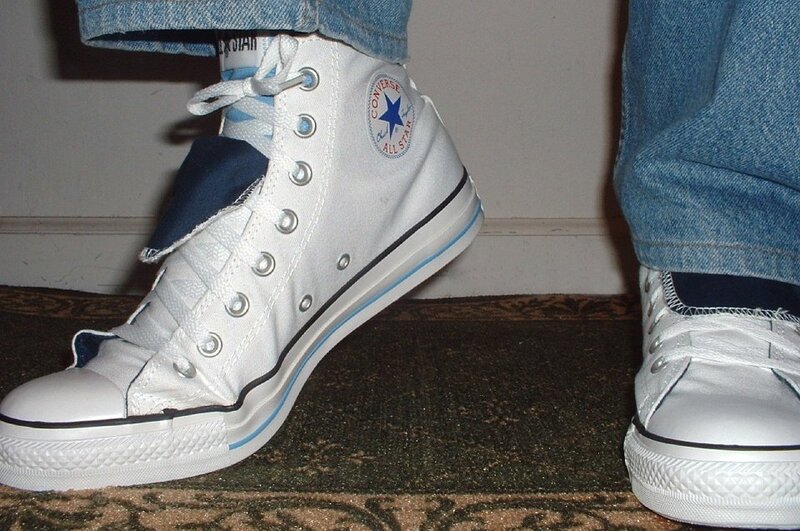 Photo gallery of double tongue high top chucks. 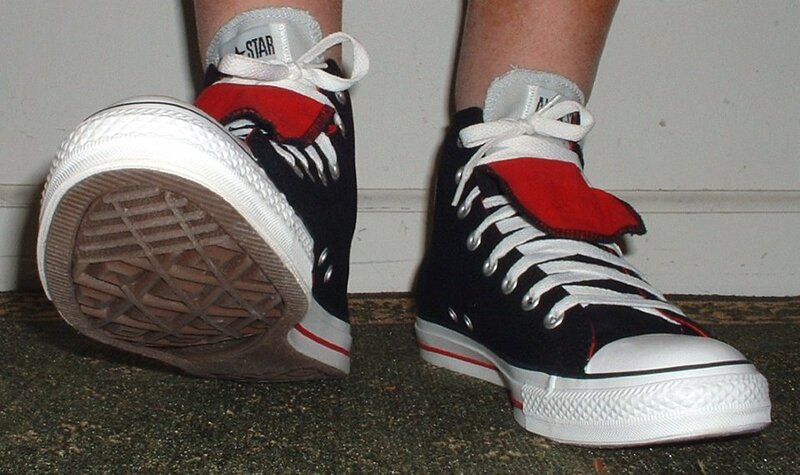 2 Double Tongue High Top Chucks Outside view of a left black and red double tongue high top. 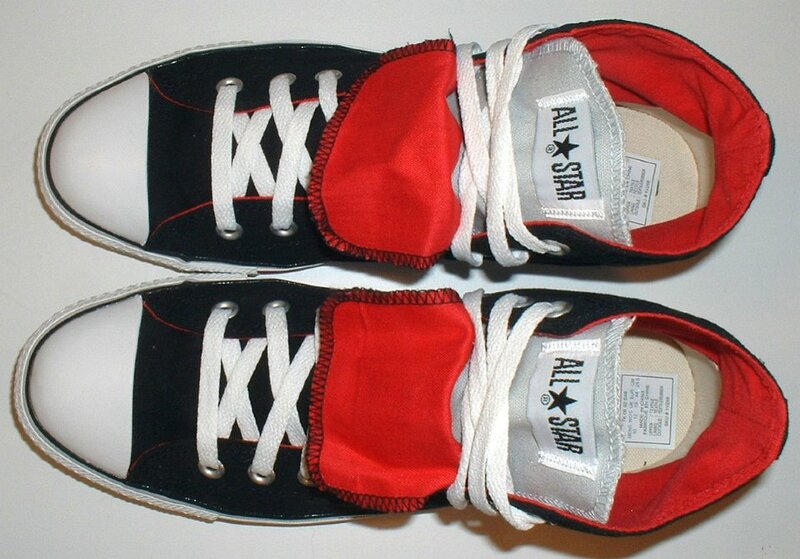 3 Double Tongue High Top Chucks Outside view of a right black and red double tongue high top. 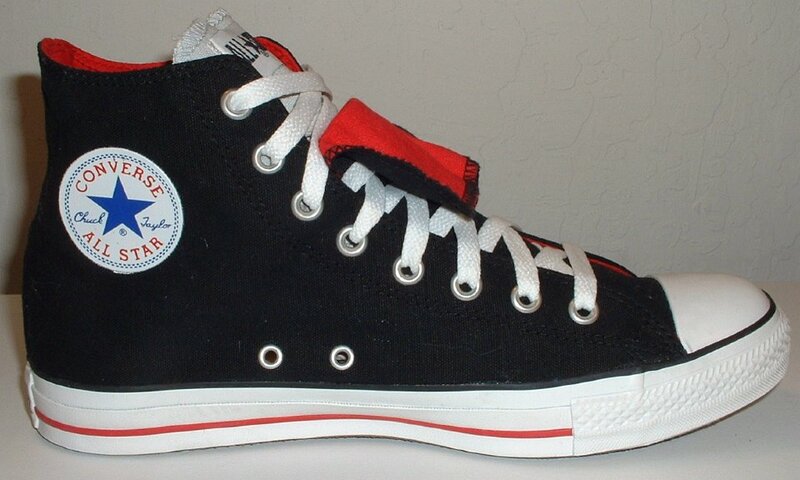 4 Double Tongue High Top Chucks Inside patch view of a right black and red double tongue high top. 5 Double Tongue High Top Chucks Front view of black and red double tongue high tops. 6 Double Tongue High Top Chucks Closeup front view of black and red double tongue high tops. 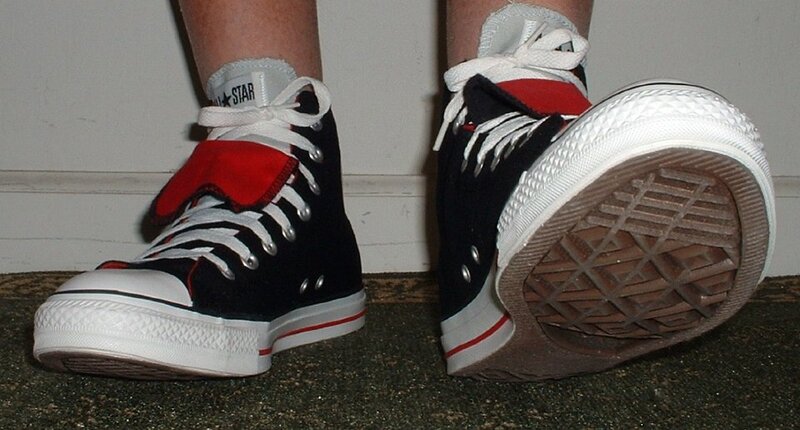 7 Double Tongue High Top Chucks Top view of black and red double tongue high tops. 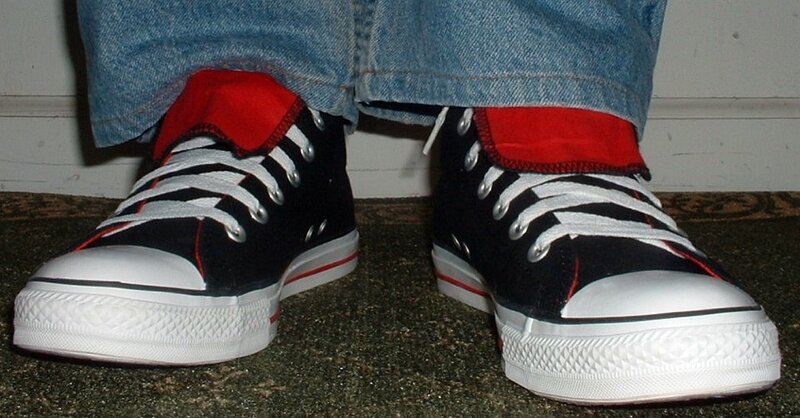 8 Double Tongue High Top Chucks Rear view of black and red double tongue high tops. 9 Double Tongue High Top Chucks Angled front view of black and red double tongue high tops. 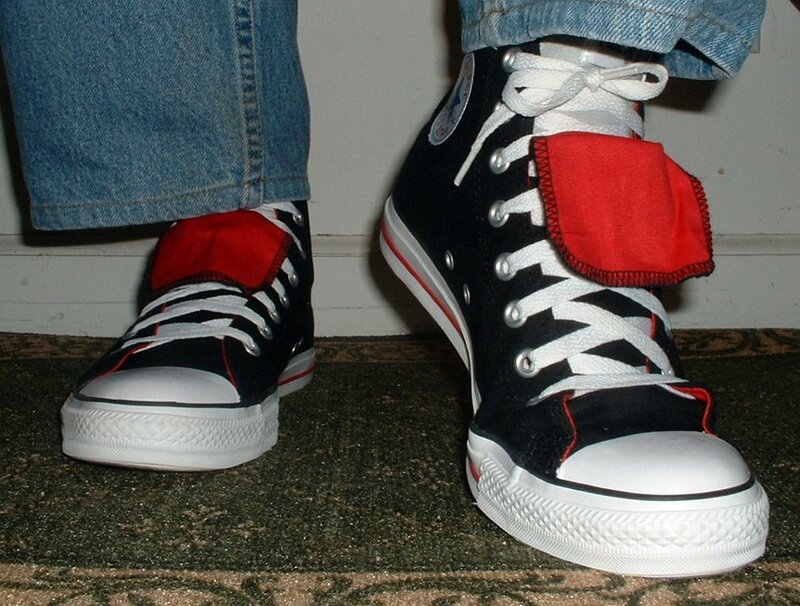 10 Double Tongue High Top Chucks Inside patch views of black and red double tongue high tops. 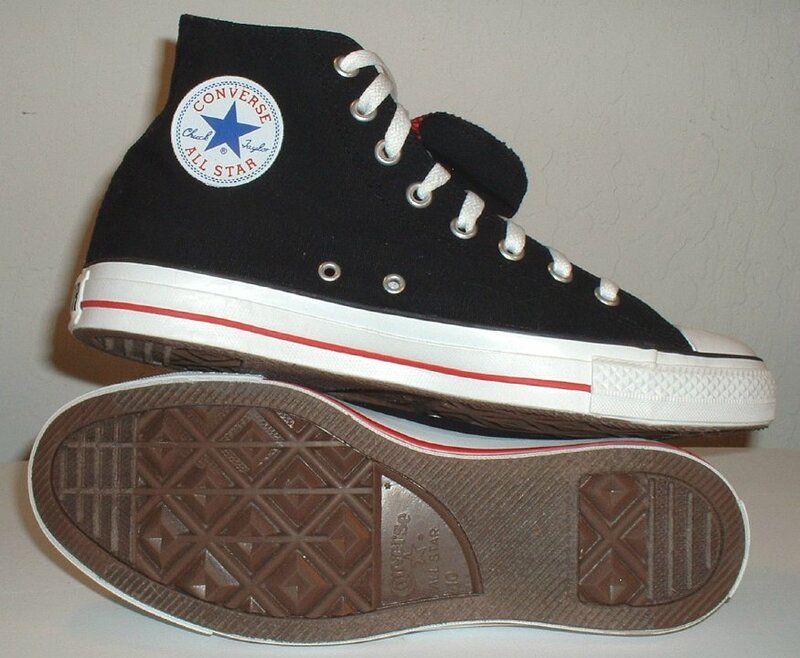 11 Double Tongue High Top Chucks Inside patch and sole views of black and red double tongue high tops. 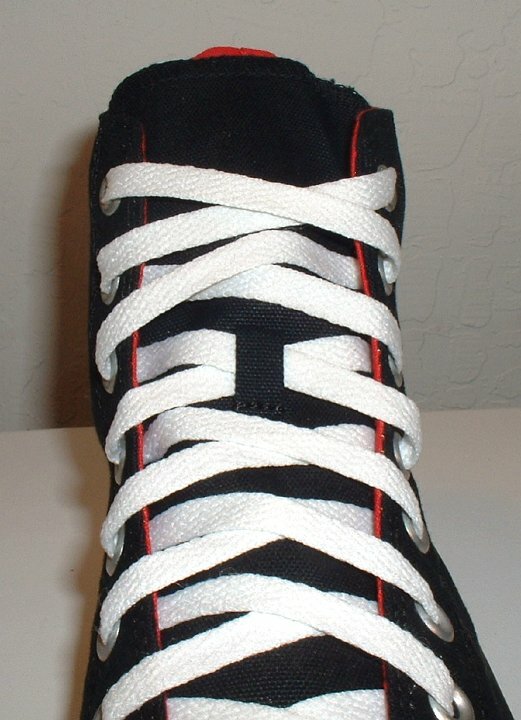 12 Double Tongue High Top Chucks Closeup of a black and red double tongue high top with both tongues laced up. 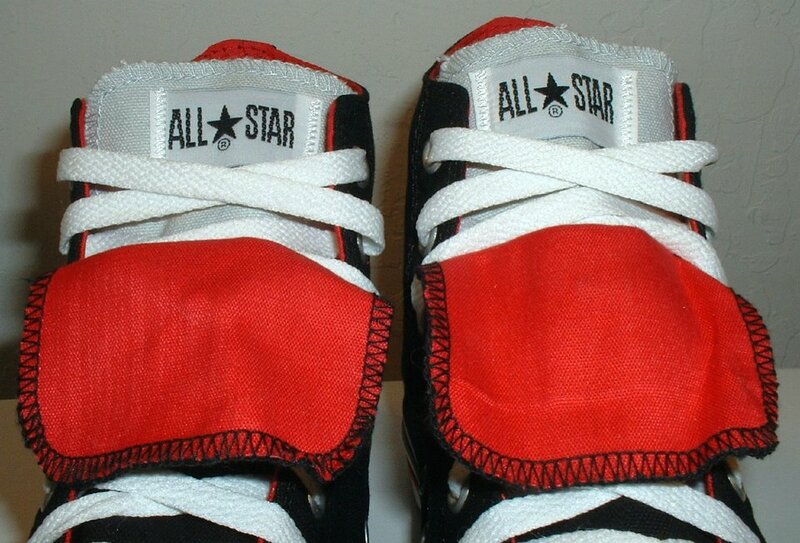 13 Double Tongue High Top Chucks Inside patch view of a left black and red double tongue high top with both tongues laced up. 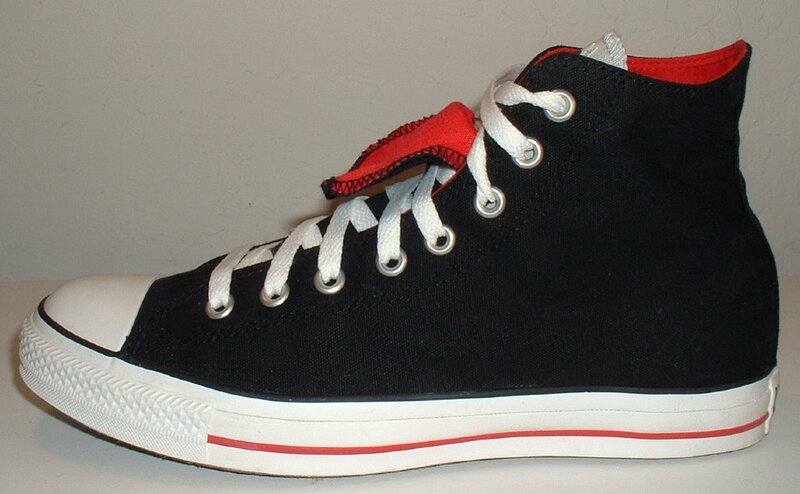 14 Double Tongue High Top Chucks Wearing black and red double tongue high tops, front view. 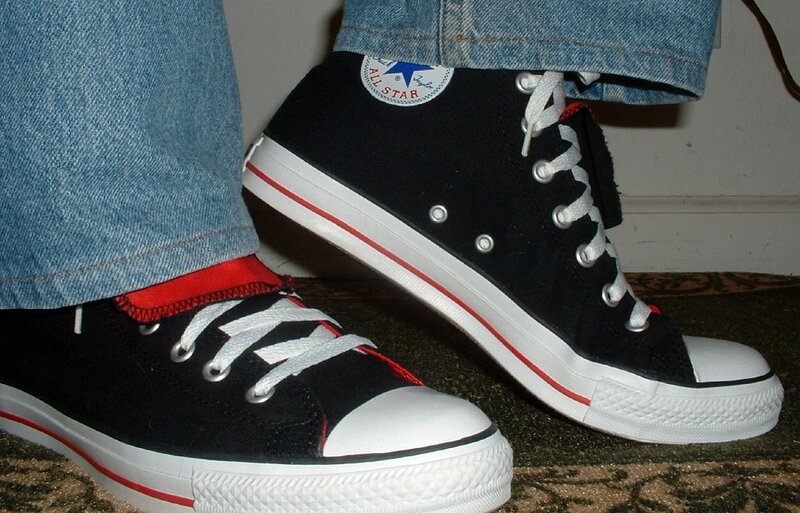 15 Double Tongue High Top Chucks Wearing black and red double tongue high tops, front view. 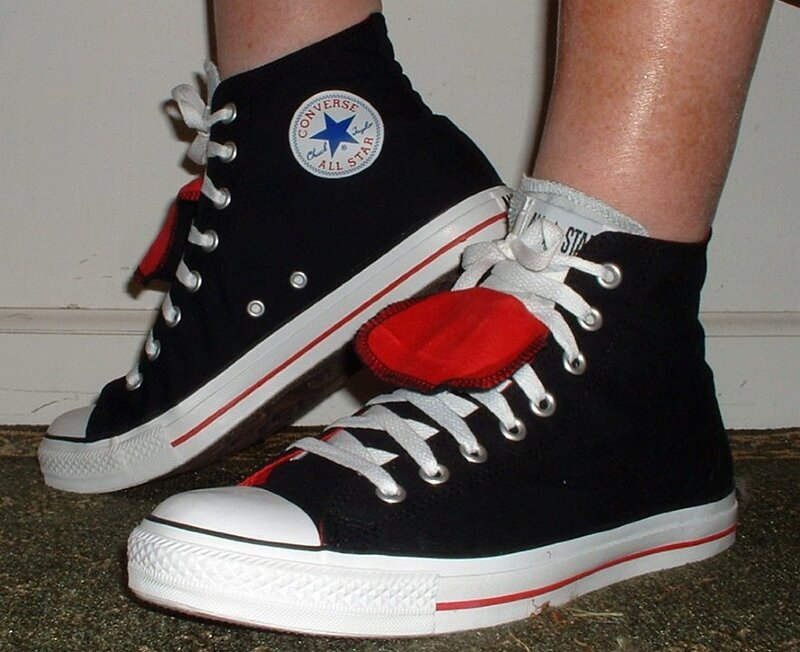 16 Double Tongue High Top Chucks Wearing black and red double tongue high tops, angled side view. 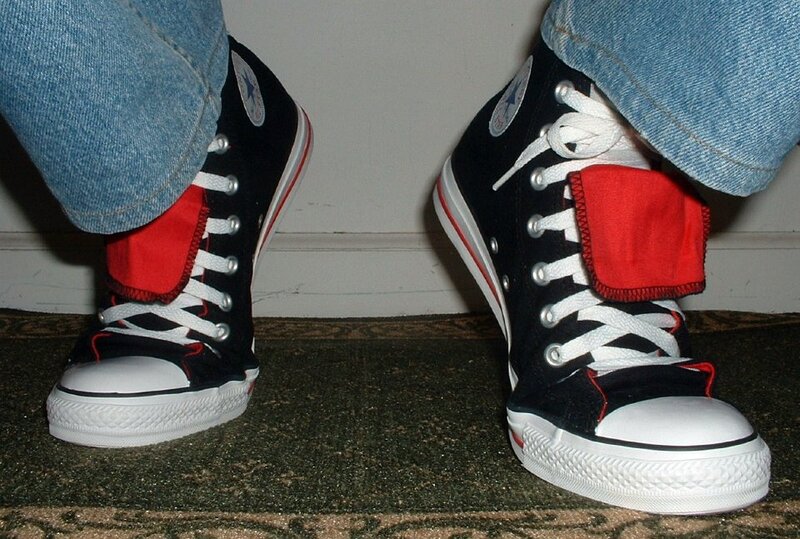 17 Double Tongue High Top Chucks Stepping out in black and red double tongue high tops, front view. 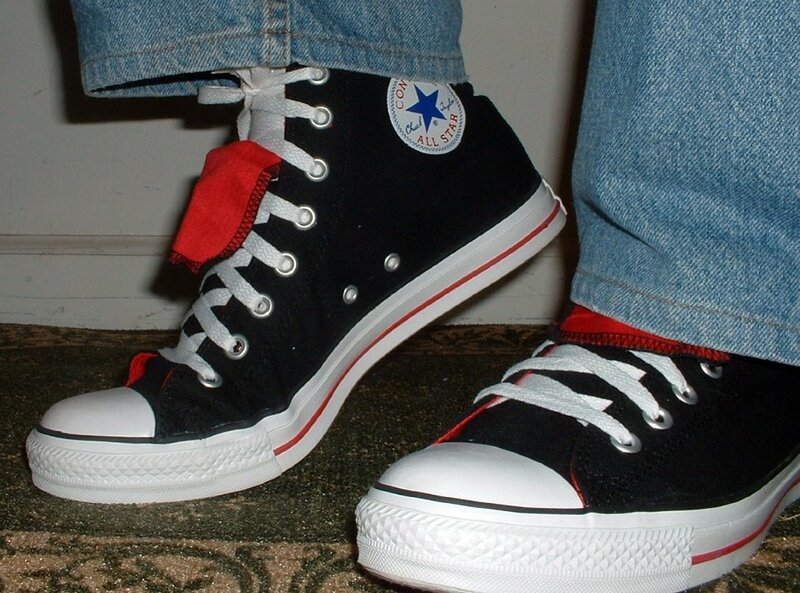 18 Double Tongue High Top Chucks Stepping out in black and red double tongue high tops, front view. 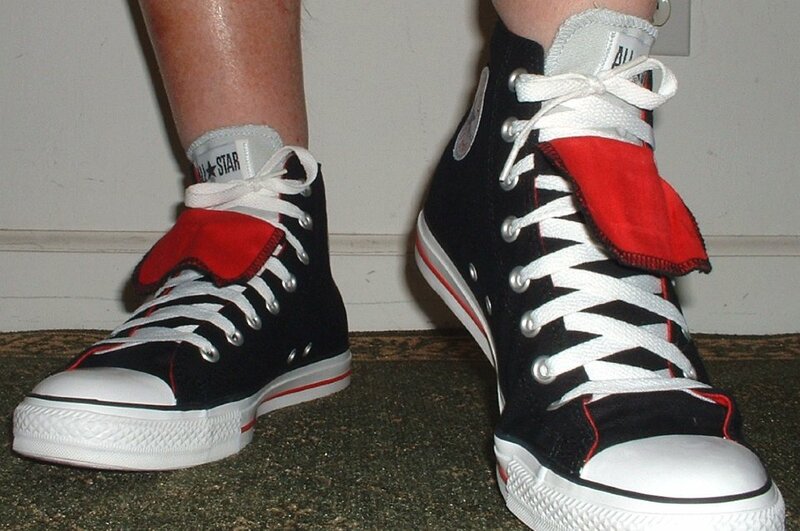 19 Double Tongue High Top Chucks Stepping out in black and red double tongue high tops, front view. 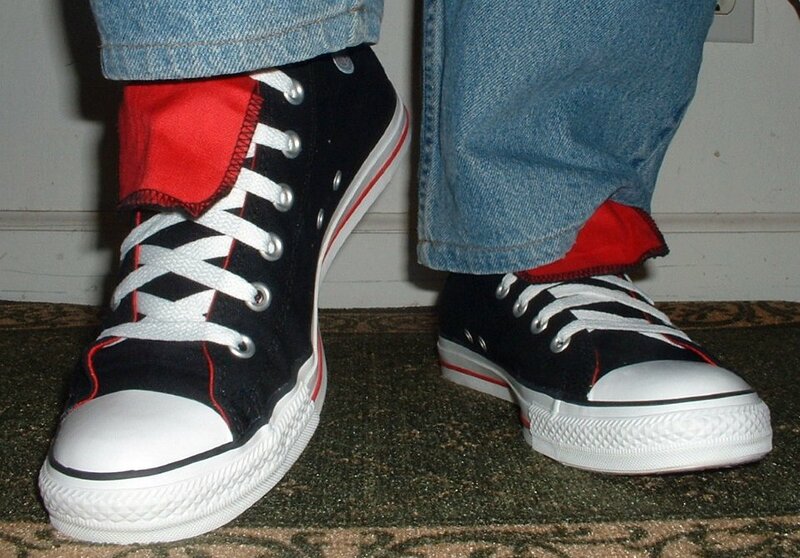 20 Double Tongue High Top Chucks Stepping up in black and red double tongue high tops, rear view. 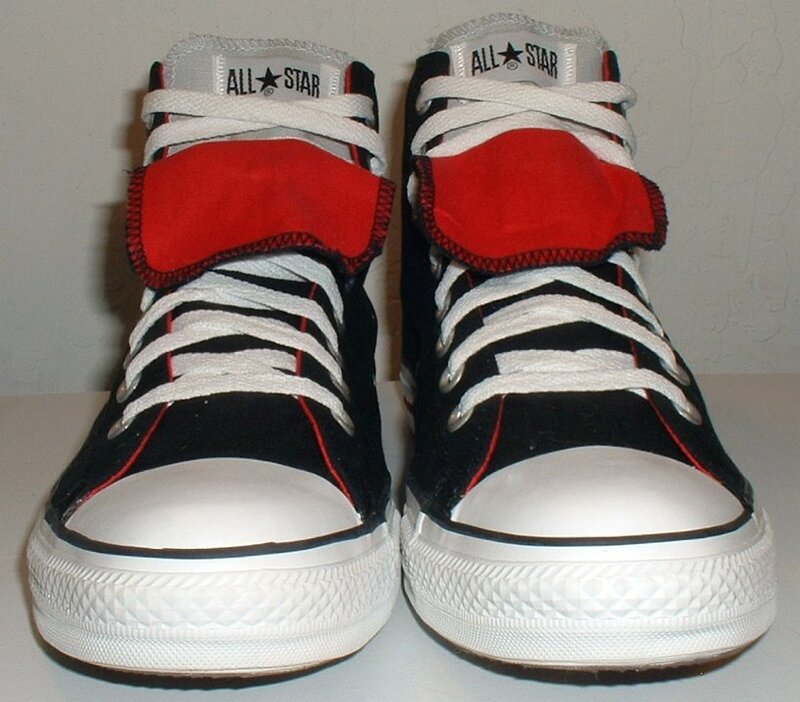 21 Double Tongue High Top Chucks Wearing black and red double tongue high tops, side view. 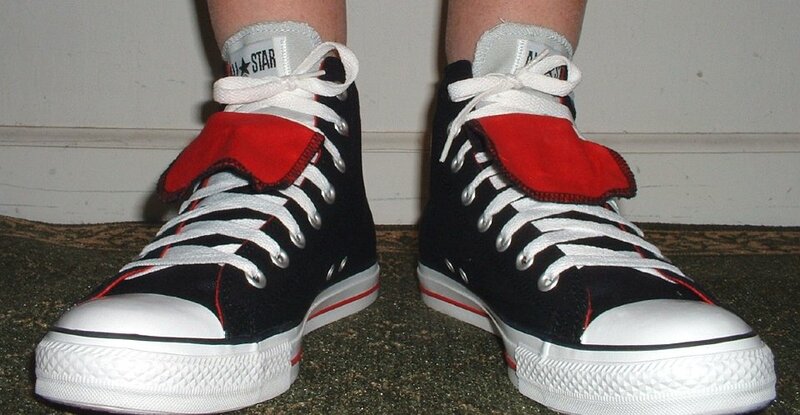 22 Double Tongue High Top Chucks Stepping up in black and red double tongue high tops, rear view. 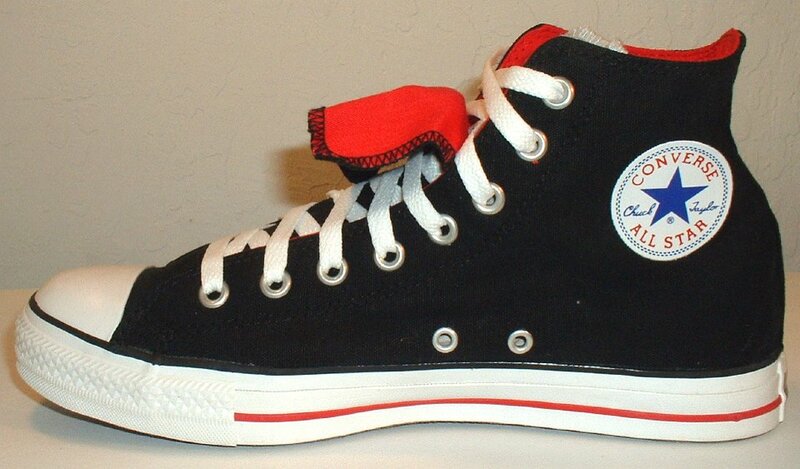 23 Double Tongue High Top Chucks Stepping up in black and red double tongue high tops, rear view. 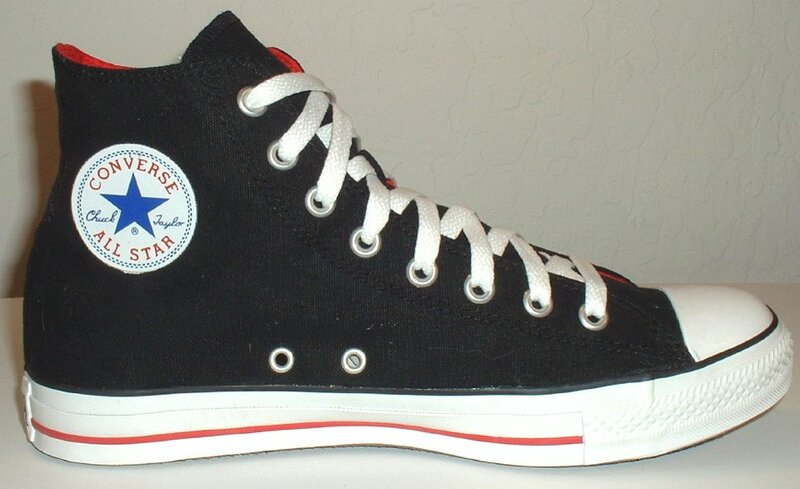 24 Double Tongue High Top Chucks Wearing black and red double tongue high tops, front view. 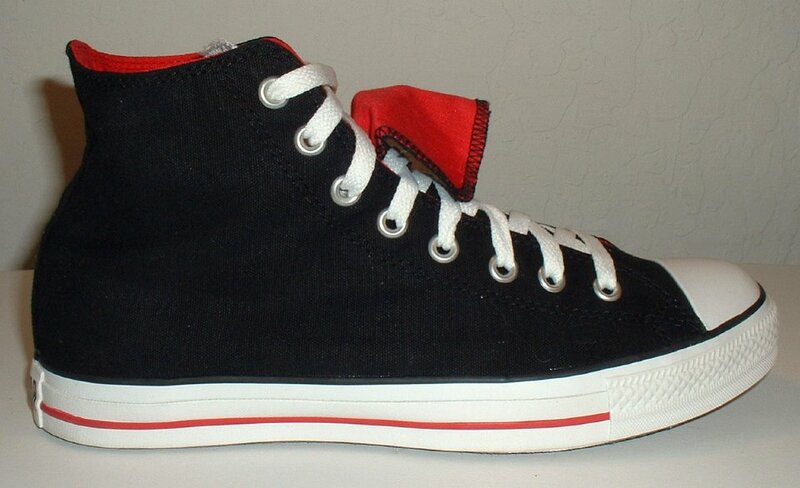 25 Double Tongue High Top Chucks Stepping up in black and red double tongue high tops, front view. 26 Double Tongue High Top Chucks Stepping up in black and red double tongue high tops, front view. 27 Double Tongue High Top Chucks Stepping up in black and red double tongue high tops, front view. 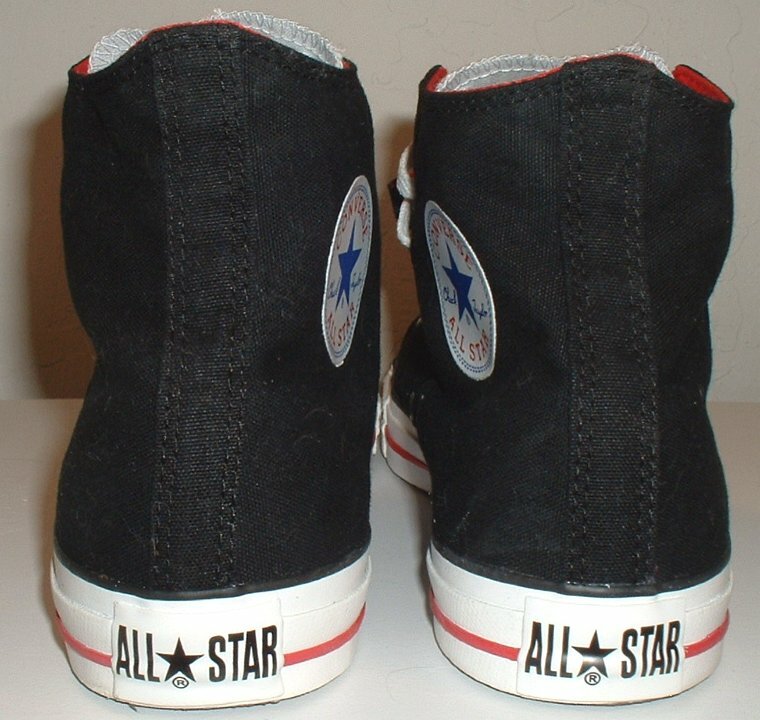 28 Double Tongue High Top Chucks Stepping up in black and red double tongue high tops, angled front and side views. 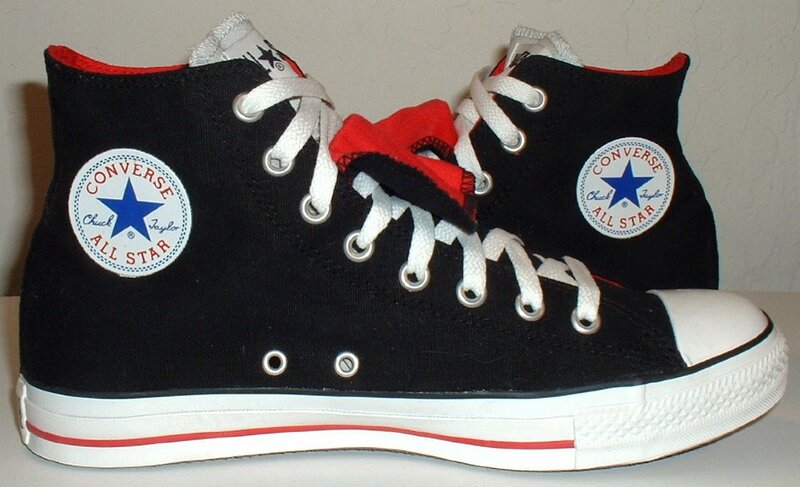 29 Double Tongue High Top Chucks Stepping up in black and red double tongue high tops, angled front and side views. 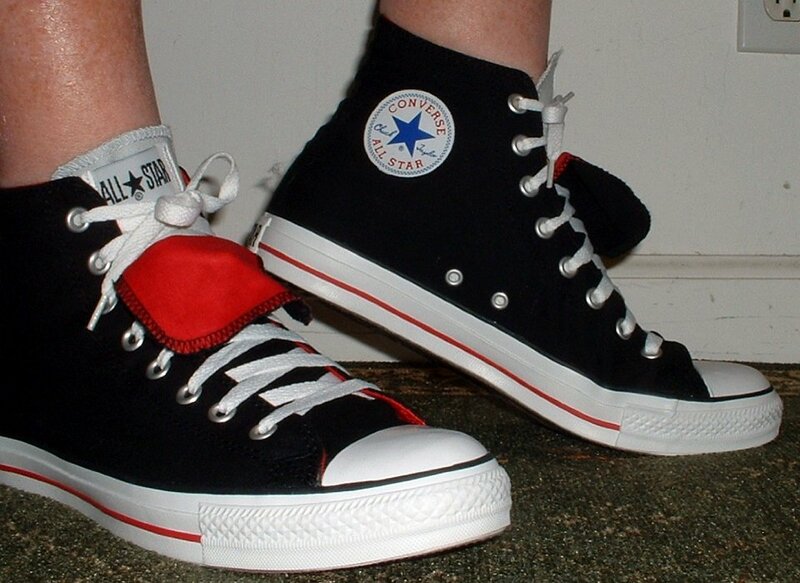 30 Double Tongue High Top Chucks Stepping up in black and red double tongue high tops, angled front and side views. 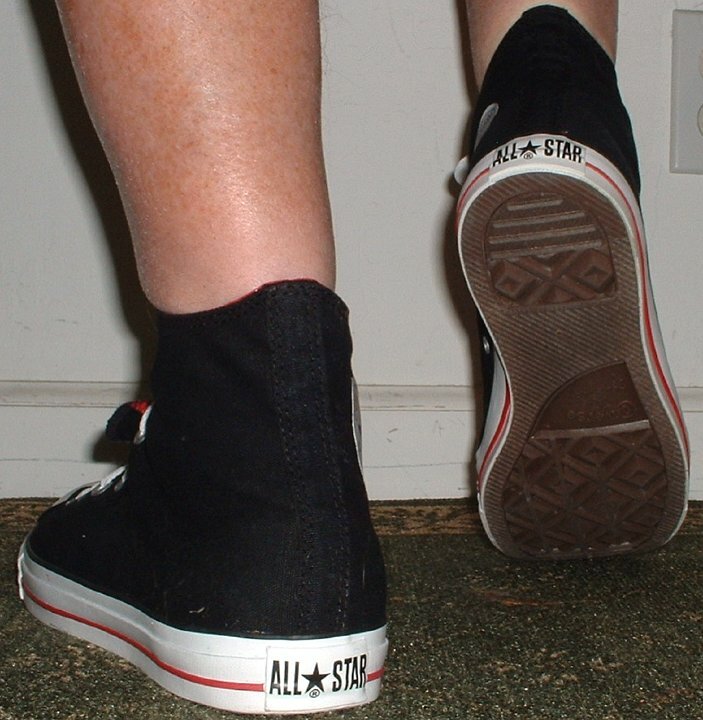 31 Double Tongue High Top Chucks Stepping up in black and red double tongue high tops, angled front and side views. 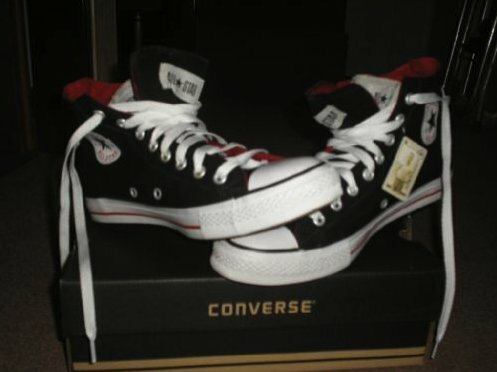 32 Double Tongue High Top Chucks Brand new pair of black and red double tongue high tops with tag and box. 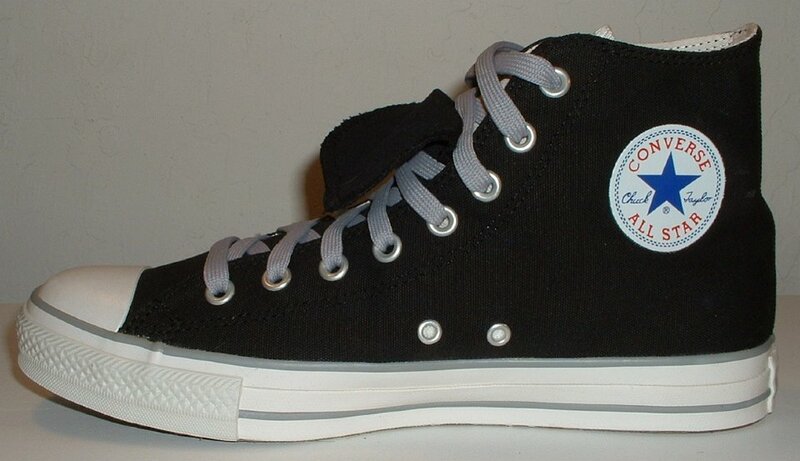 33 Double Tongue High Top Chucks Inside patch view of a right black and gray double tongue high top with gray shoelaces. 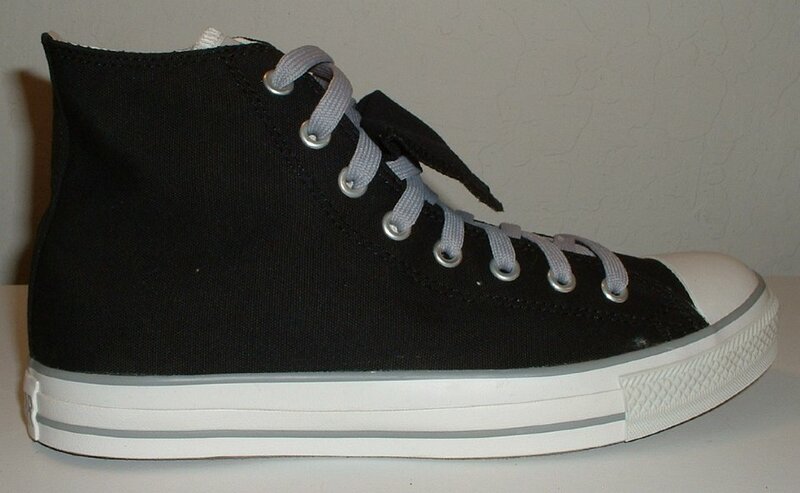 34 Double Tongue High Top Chucks Outside view of a right black and gray double tongue high top with gray shoelaces. 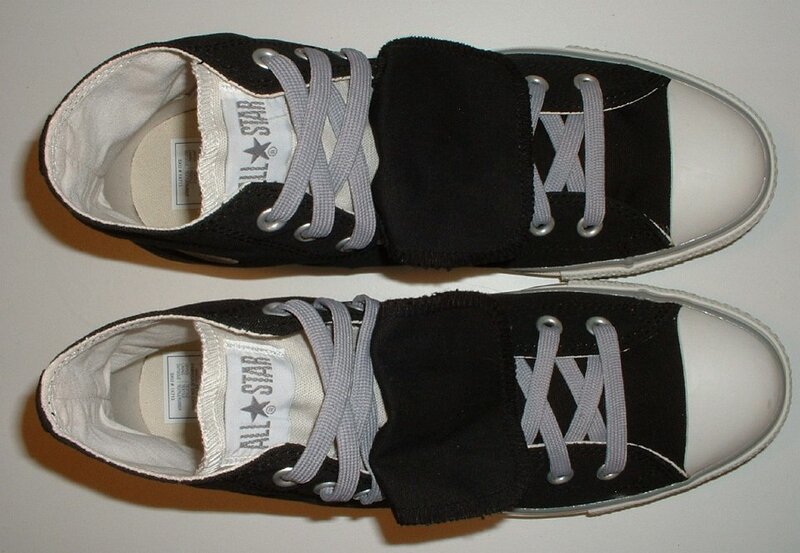 35 Double Tongue High Top Chucks Inside patch view of a left black and gray double tongue high top with gray shoelaces. 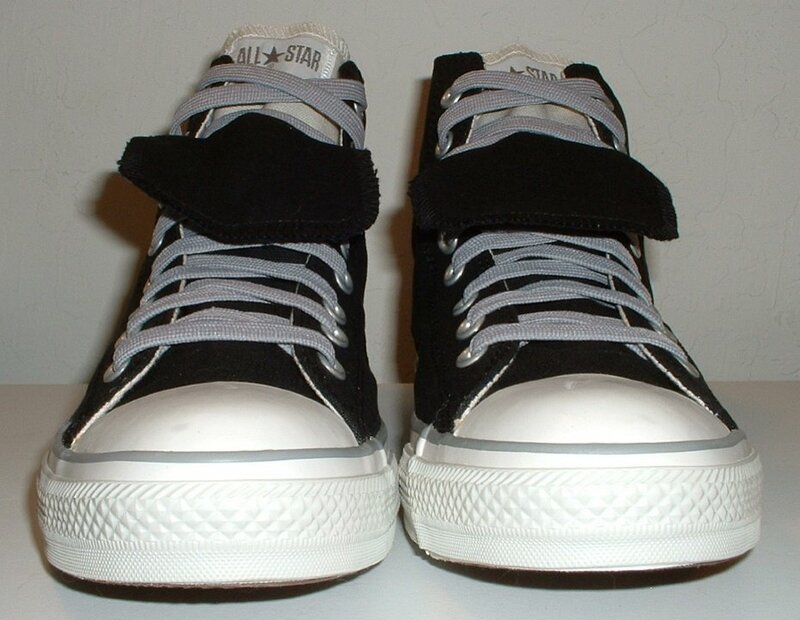 36 Double Tongue High Top Chucks Outside view of a left black and gray double tongue high top with gray shoelaces. 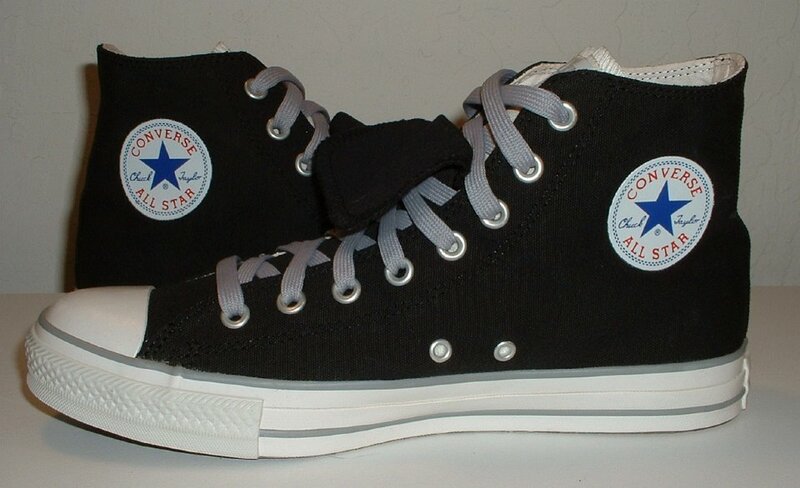 37 Double Tongue High Top Chucks Rear view of black and gray double tongue high tops with gray shoelaces. 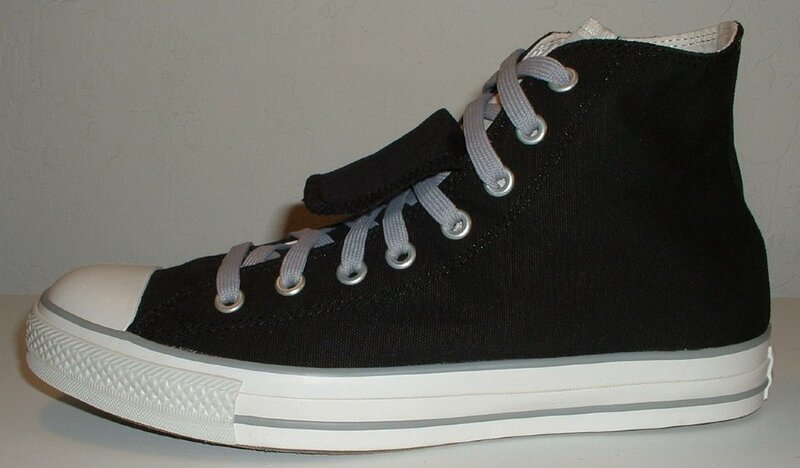 38 Double Tongue High Top Chucks Front view of black and gray double tongue high tops with gray shoelaces. 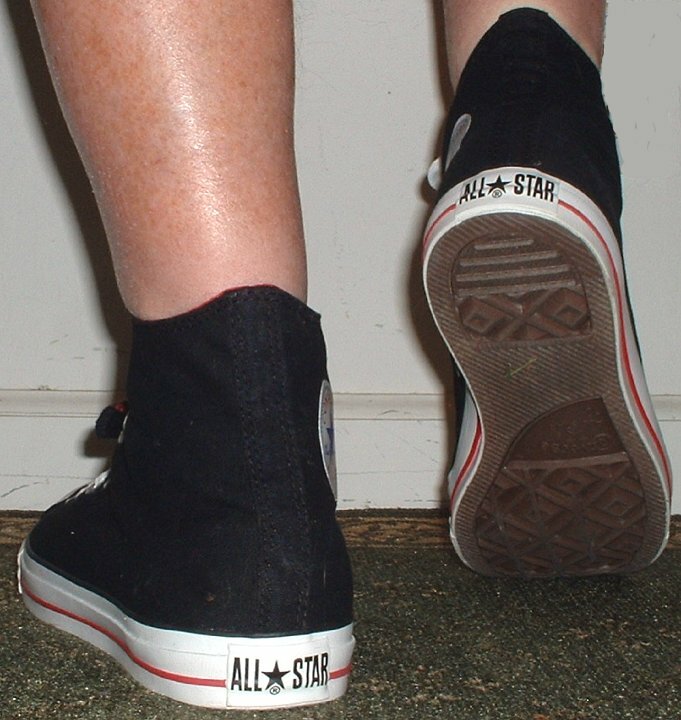 39 Double Tongue High Top Chucks Angled front view of black and tan double tongue high tops with gray shoelaces. 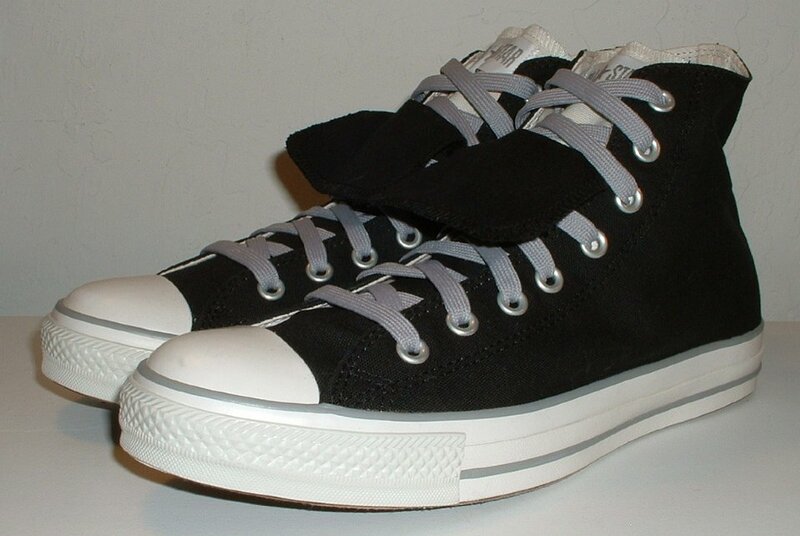 40 Double Tongue High Top Chucks Angled side view of black and gray double tongue high tops with gray shoelaces. 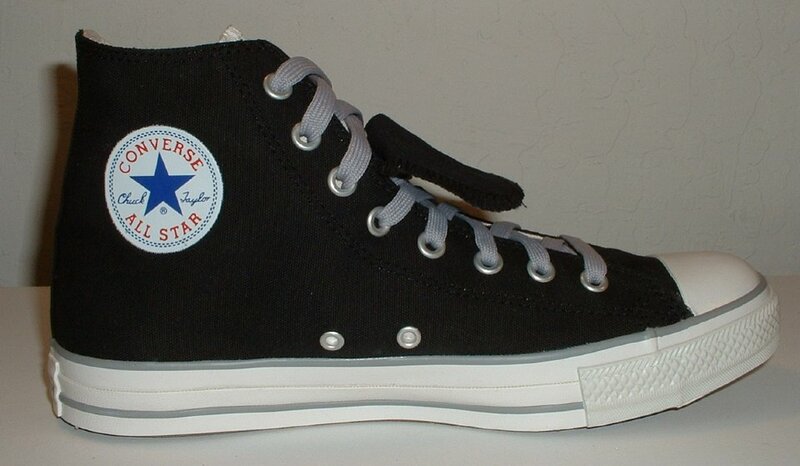 41 Double Tongue High Top Chucks Top view of black and gray double tongue high tops with gray shoelaces. 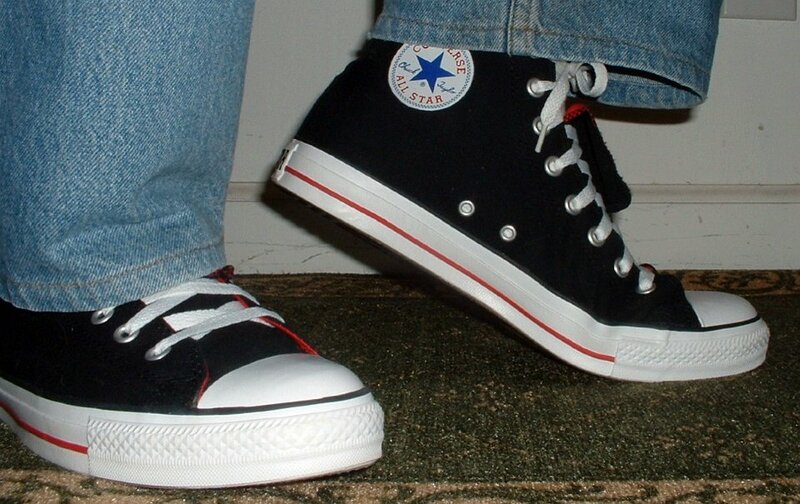 42 Double Tongue High Top Chucks Inside patch views of black and gray double tongue high tops with gray shoelaces. 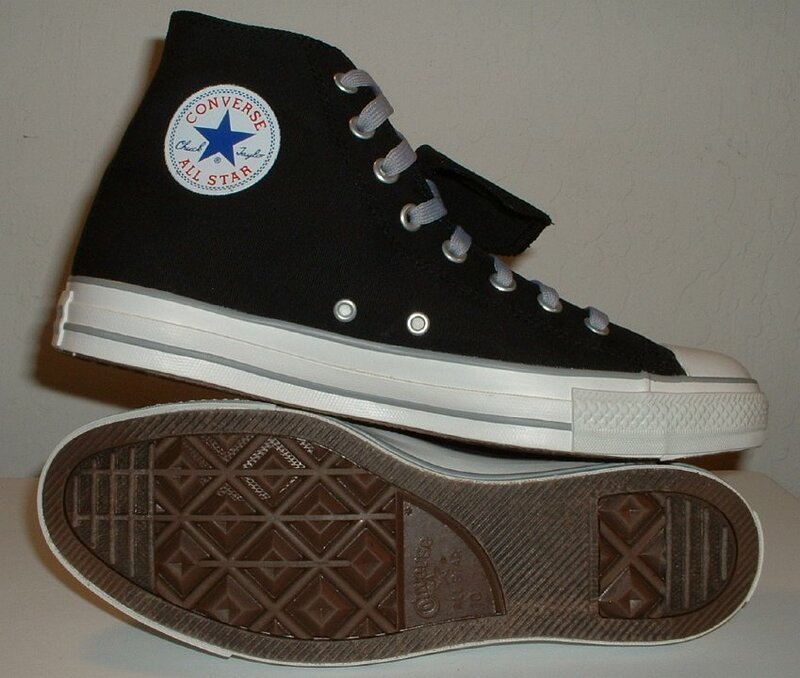 43 Double Tongue High Top Chucks Inside patch and sole views of black and gray double tongue high tops with gray shoelaces. 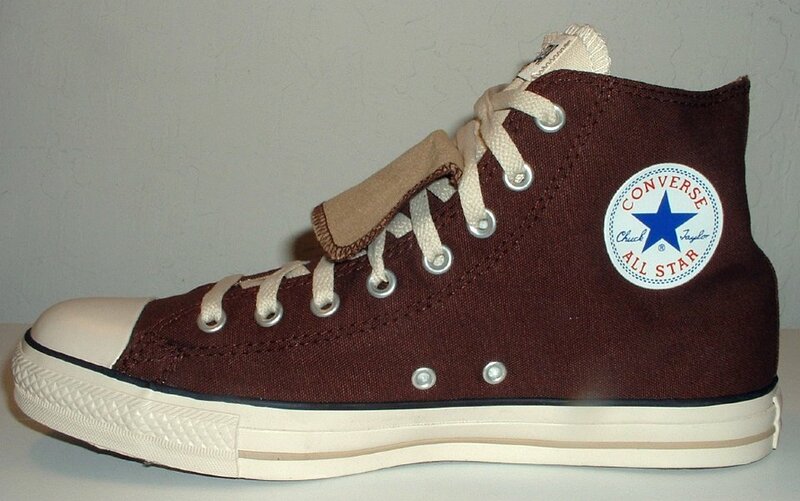 44 Double Tongue High Top Chucks Inside patch view of a right brown and tan double tongue high top. 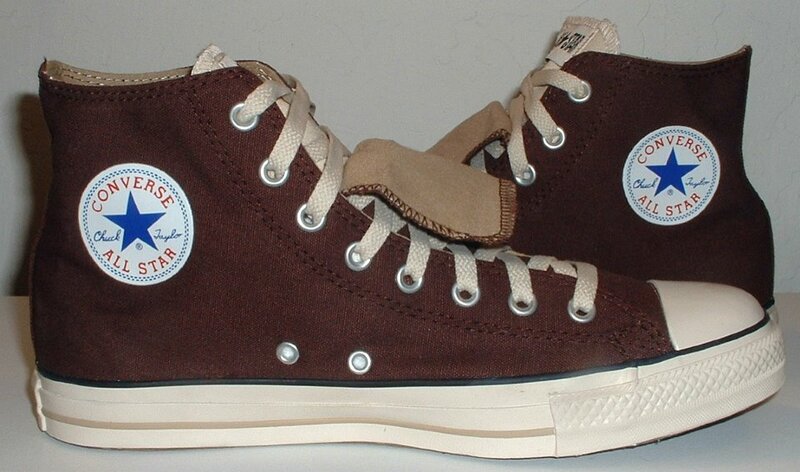 45 Double Tongue High Top Chucks Outside view of a right brown and tan double tongue high top. 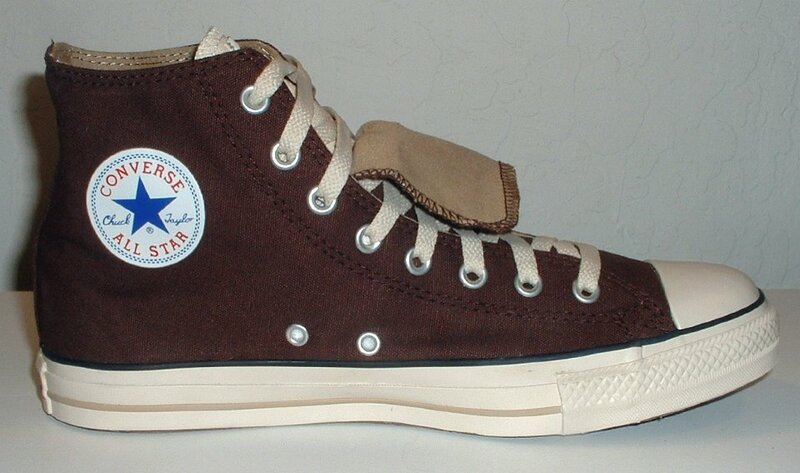 46 Double Tongue High Top Chucks Inside patch view of a left brown and tan double tongue high top. 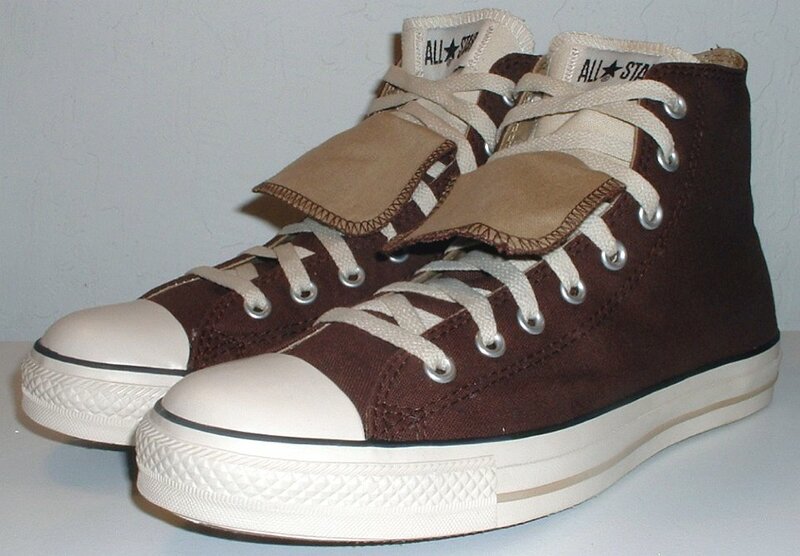 47 Double Tongue High Top Chucks Outside view of a left brown and tan double tongue high top. 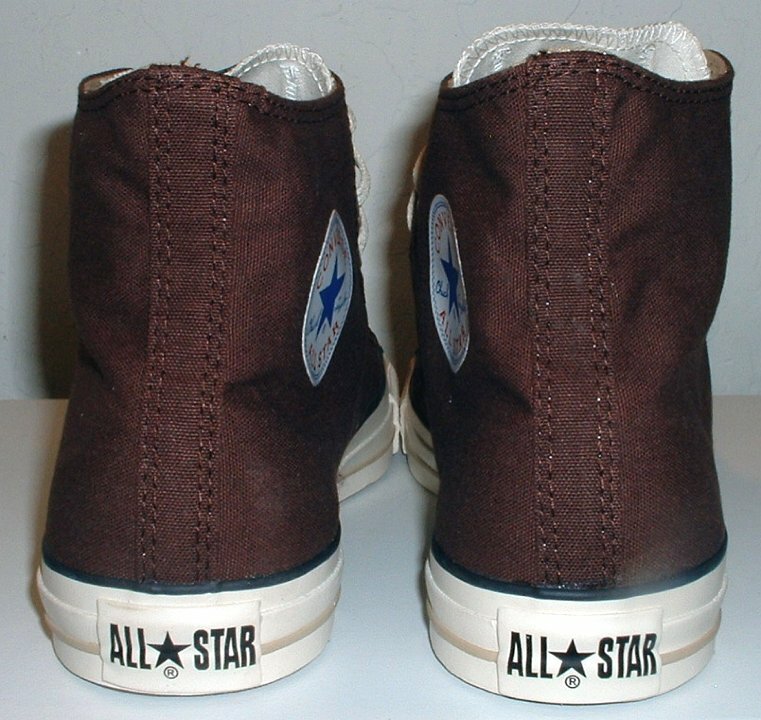 48 Double Tongue High Top Chucks Rear view of brown and tan double tongue high tops. 49 Double Tongue High Top Chucks Front view of brown and tan double tongue high tops. 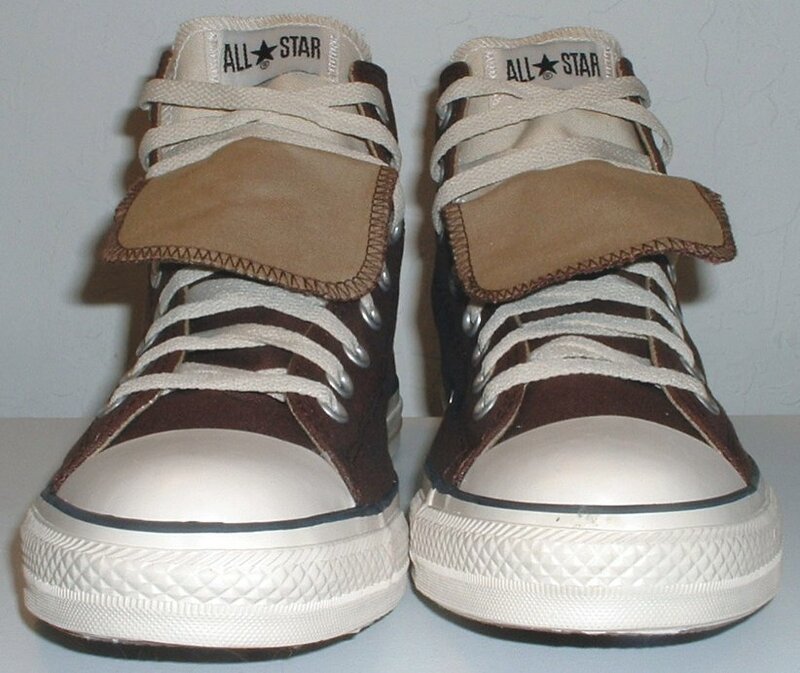 50 Double Tongue High Top Chucks Top view of brown and tan double tongue high tops. 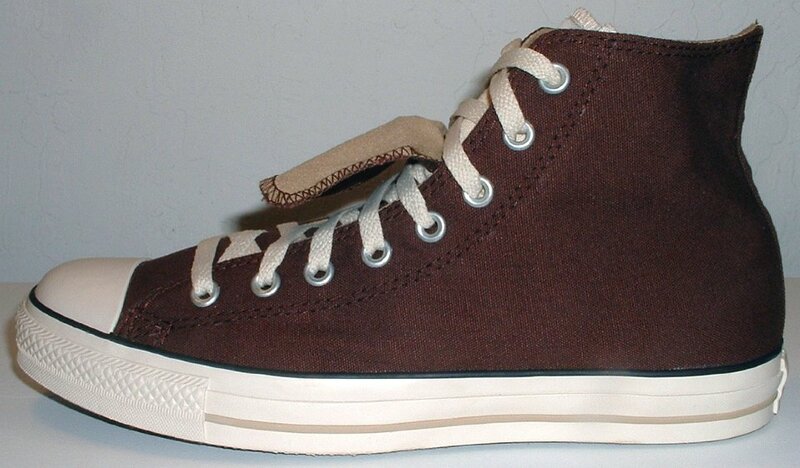 51 Double Tongue High Top Chucks Angled side view of brown and tan double tongue high tops. 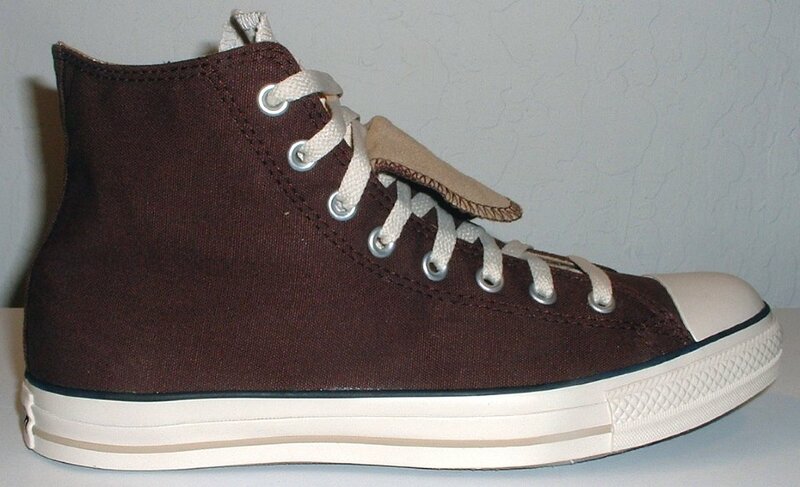 52 Double Tongue High Top Chucks Inside patch views of brown and tan double tongue high tops. 53 Double Tongue High Top Chucks Angled front view of brown and tan double tongue high tops. 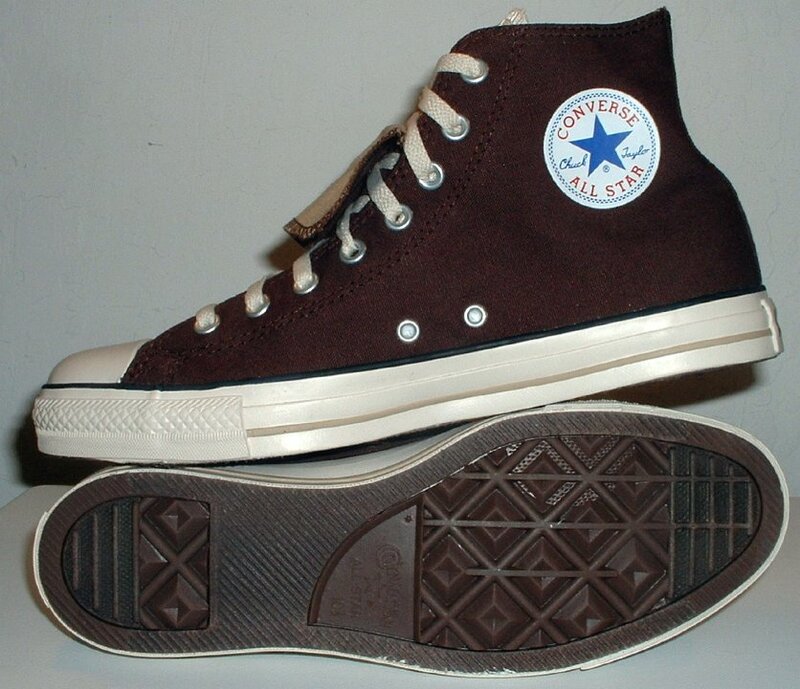 54 Double Tongue High Top Chucks Inside patch and sole views of brown and tan double tongue high tops. 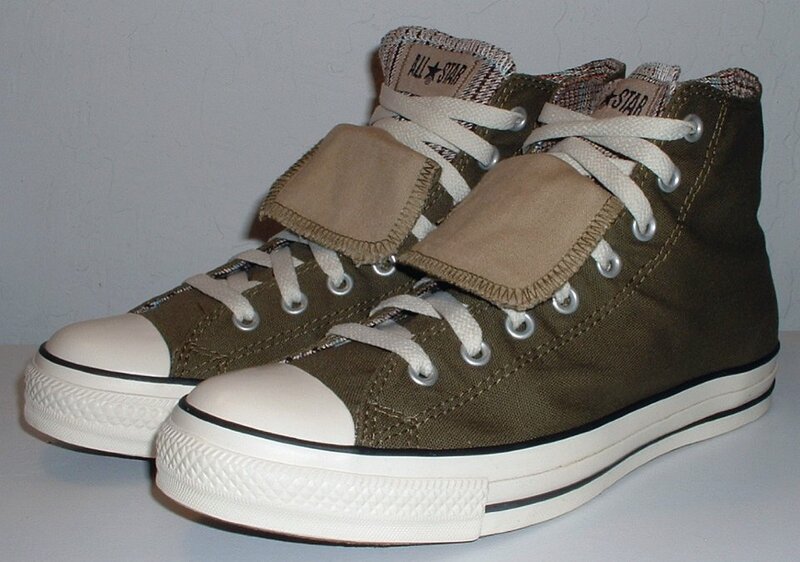 55 Double Tongue High Top Chucks Inside patch view of a right olive and plaid double tongue high top. 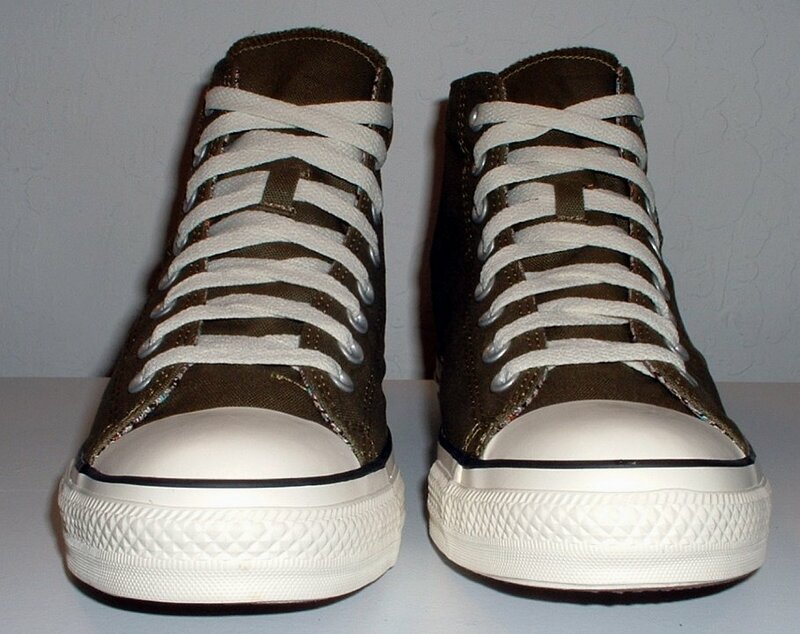 56 Double Tongue High Top Chucks Outside view of a right olive and plaid double tongue high top. 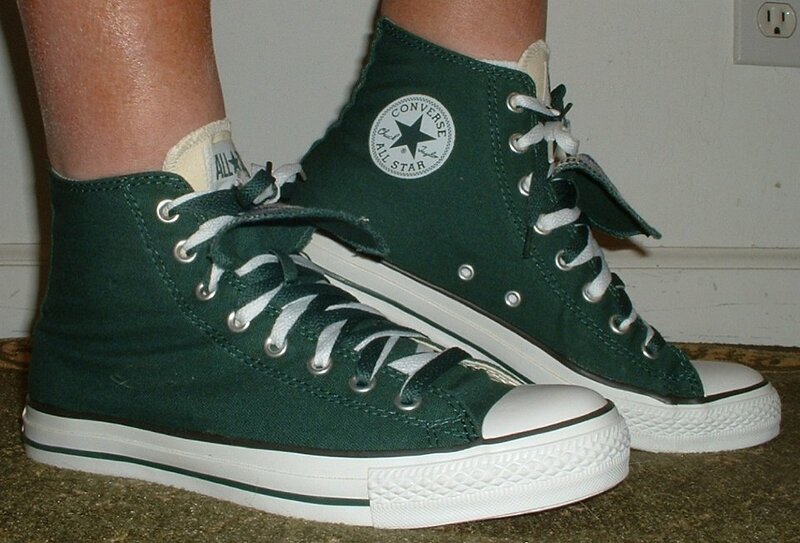 57 Double Tongue High Top Chucks Outside view of a left olive and plaid double tongue high top. 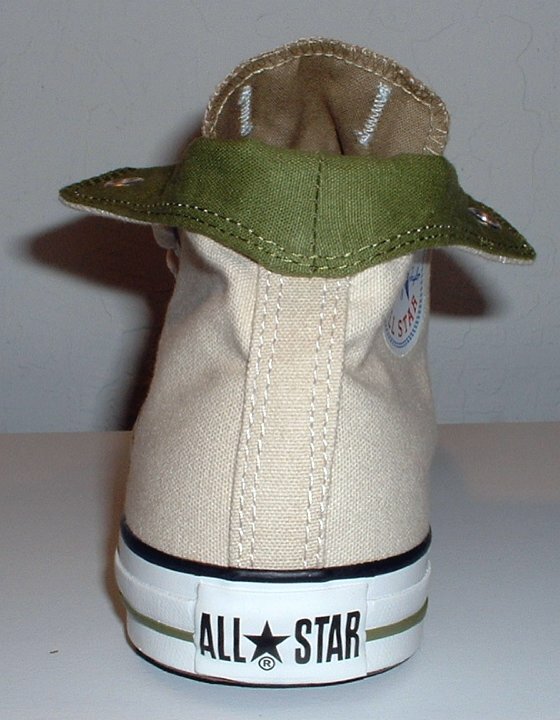 58 Double Tongue High Top Chucks Inside patch view of a left olive and plaid double tongue high top. 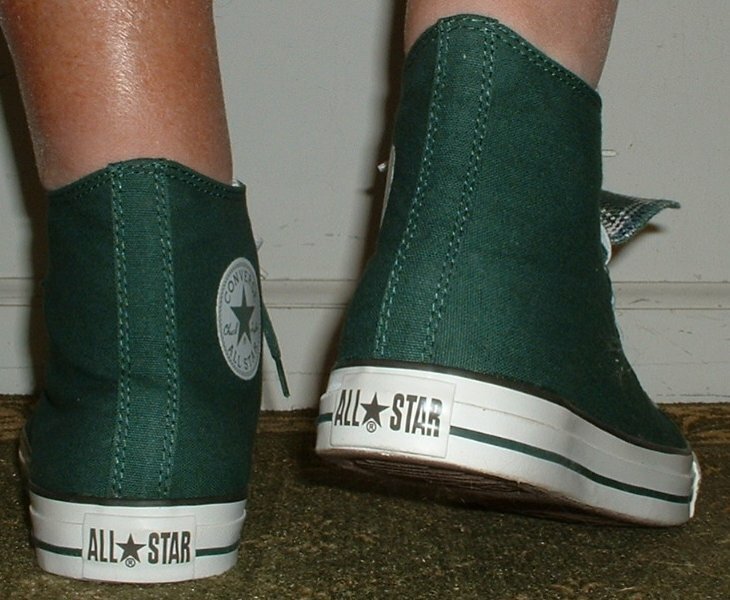 59 Double Tongue High Top Chucks Rear view of olive and plaid double tongue high tops. 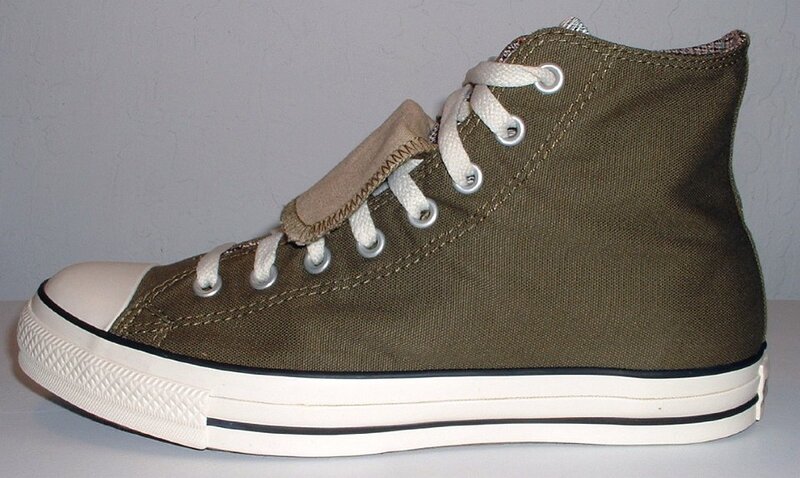 60 Double Tongue High Top Chucks Angled side view of olive and plaid double tongue high tops. 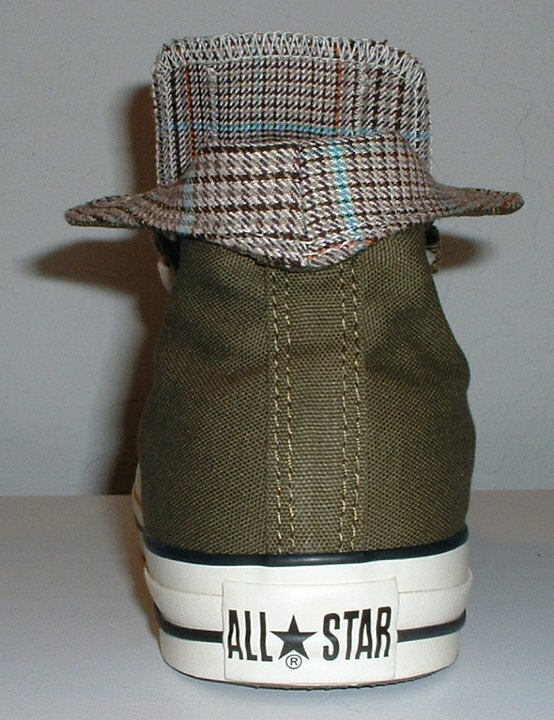 61 Double Tongue High Top Chucks Front view of olive and plaid double tongue high tops. 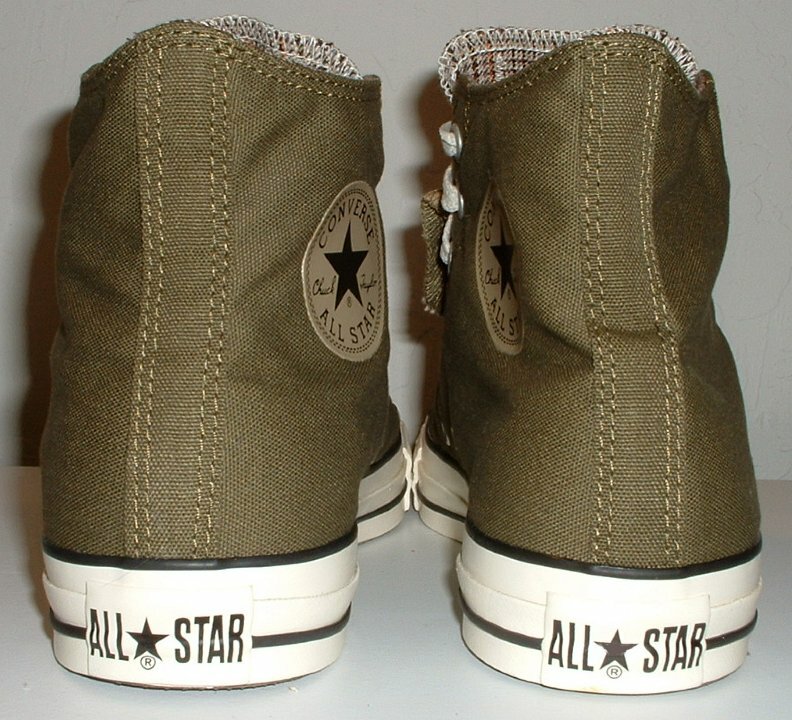 62 Double Tongue High Top Chucks Top view of olive and plaid double tongue high tops. 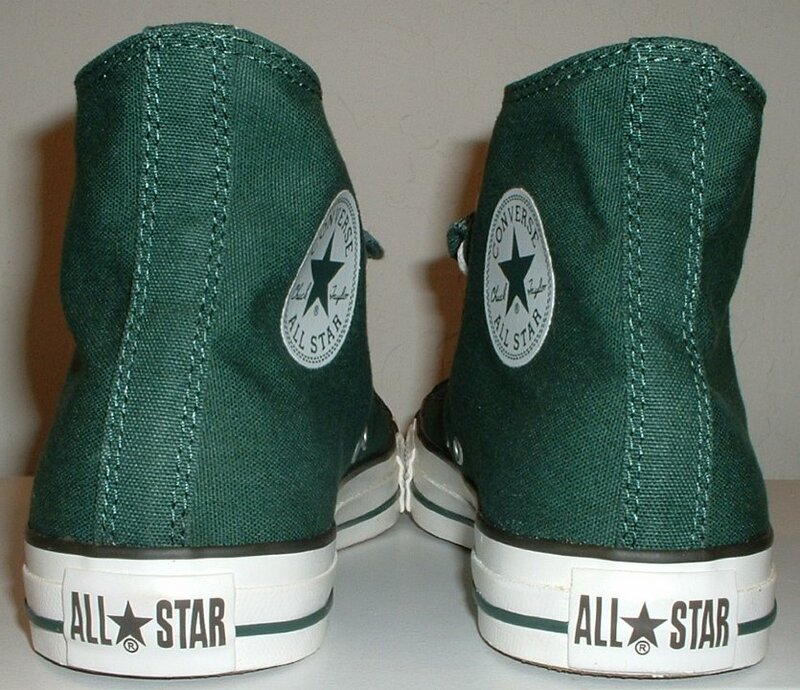 63 Double Tongue High Top Chucks nside patch views of olive and plaid double tongue high tops. 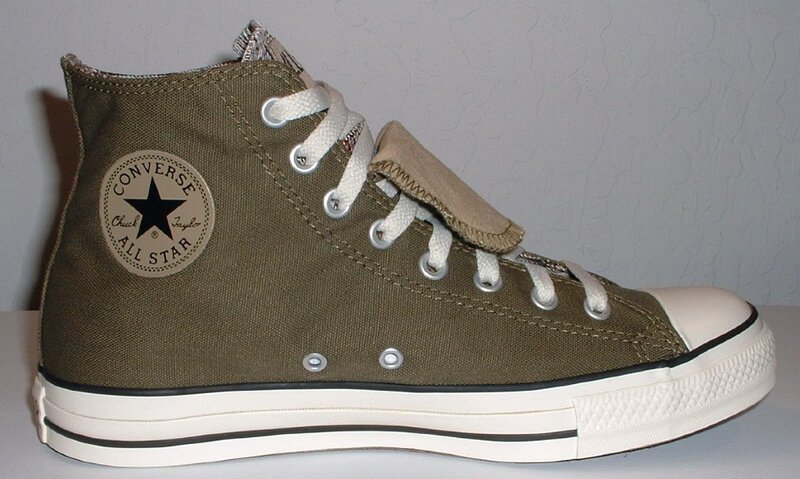 64 Double Tongue High Top Chucks Angled front views of olive and plaid double tongue high tops. 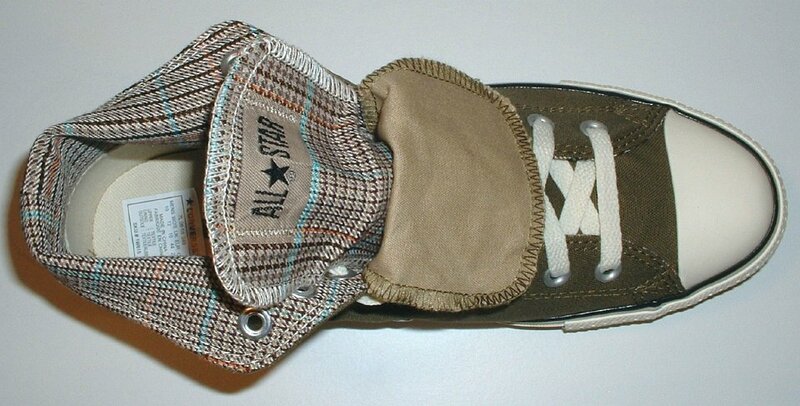 65 Double Tongue High Top Chucks Inside patch and sole views of olive and plaid double tongue high tops. 66 Double Tongue High Top Chucks Front view of olive and plaid double tongue high tops, with both tongues laced to the top. 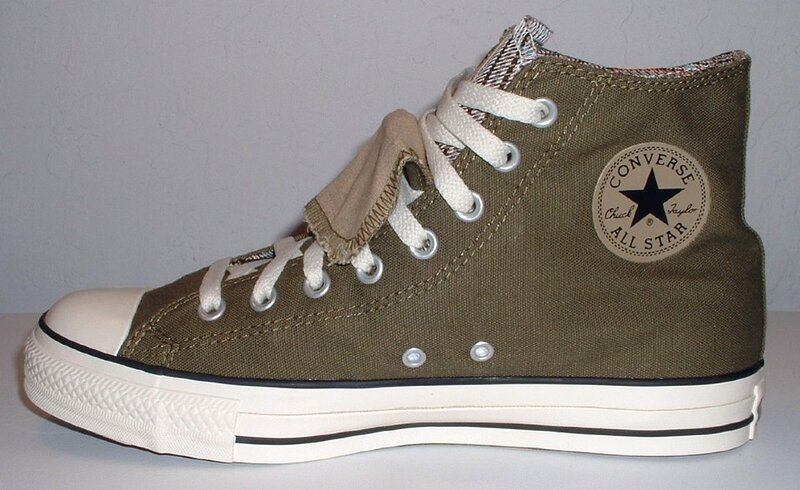 67 Double Tongue High Top Chucks Closeup of an olive and plaid double tongue high top lace to the top. 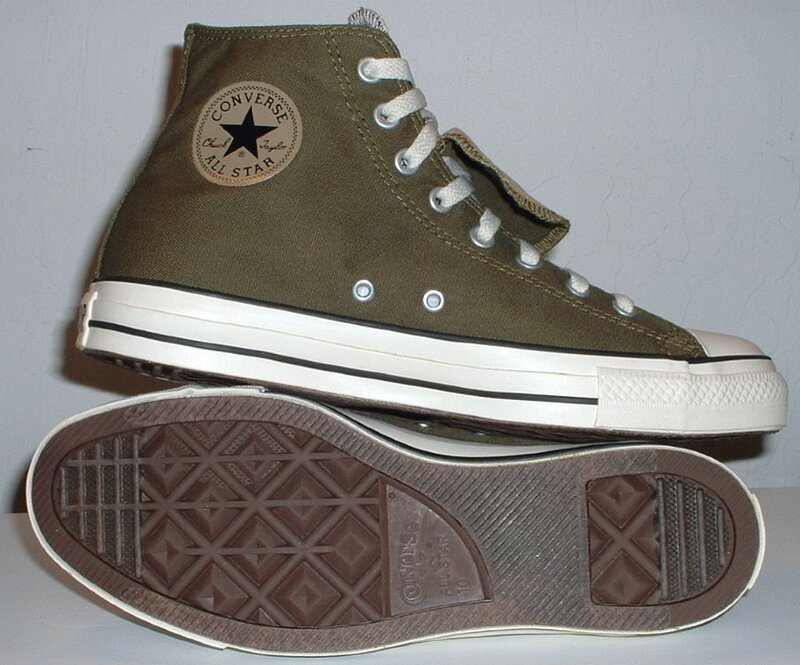 68 Double Tongue High Top Chucks Top view of a left folded down olive and plaid double tongue high top. 69 Double Tongue High Top Chucks Front view of a left folded down olive and plaid double tongue high top. 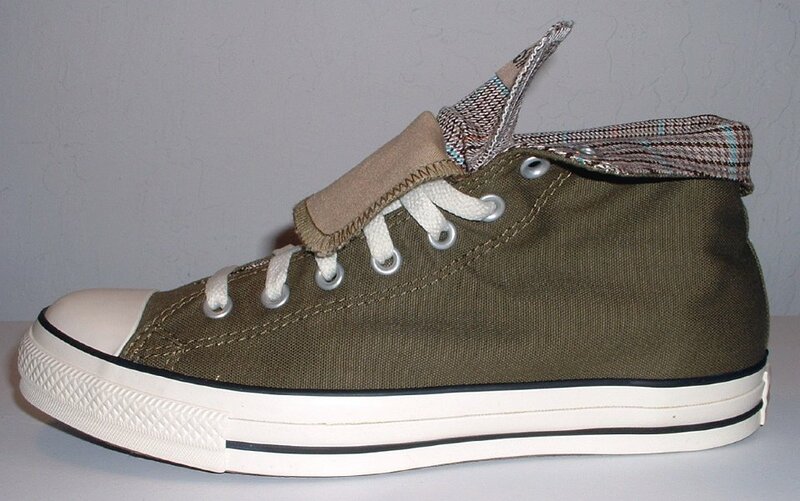 70 Double Tongue High Top Chucks Outside view of a left folded down olive and plaid double tongue high top. 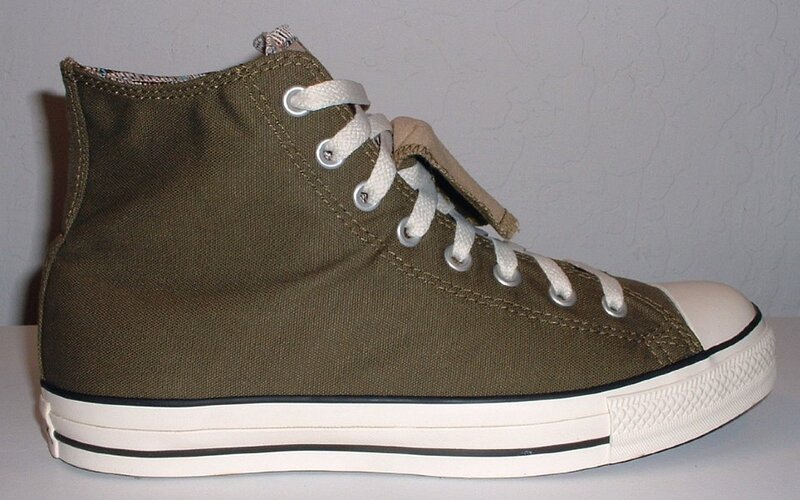 71 Double Tongue High Top Chucks Rear view of a left folded down olive and plaid double tongue high top. 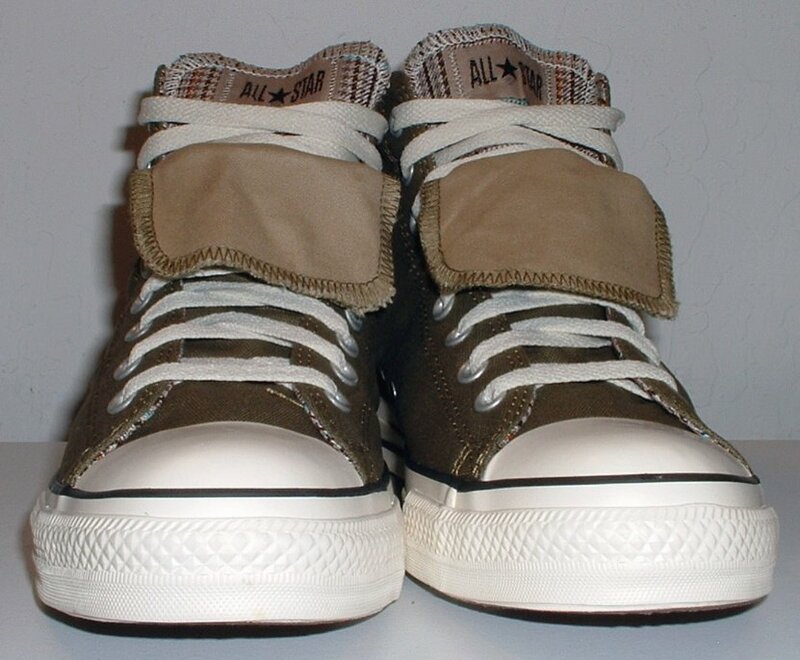 72 Double Tongue High Top Chucks Inside patch view of a left folded down olive and plaid double tongue high top. 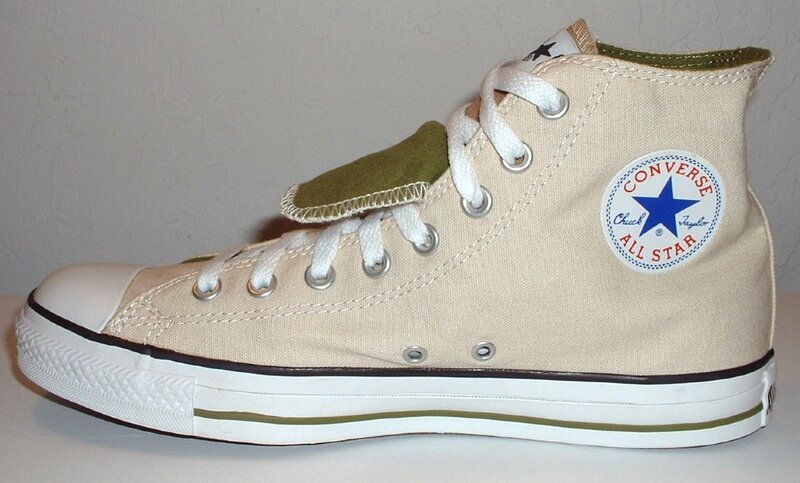 73 Double Tongue High Top Chucks Inside patch view of a right tan and olive double tongue high top. 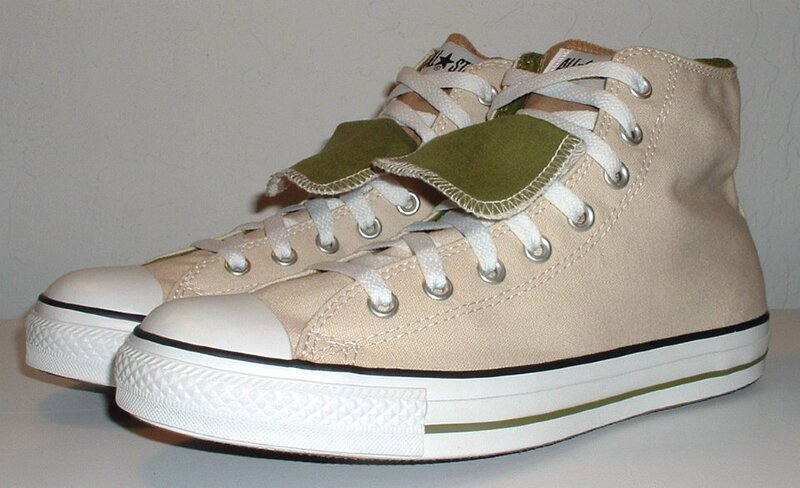 74 Double Tongue High Top Chucks Outside view of a right tan and olive double tongue high top. 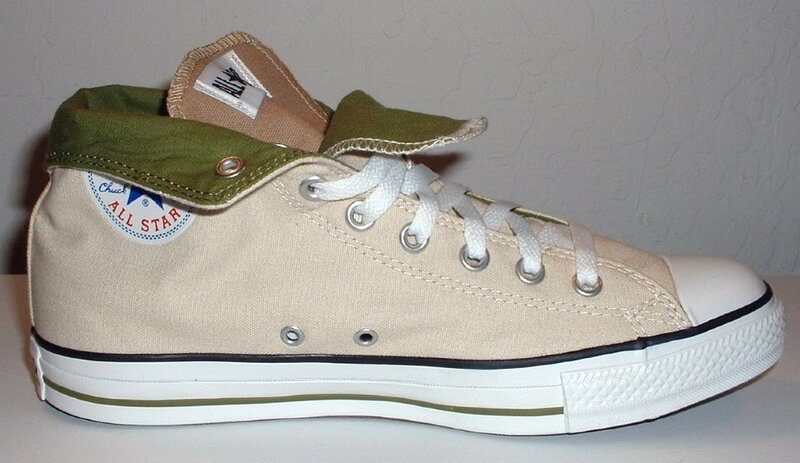 75 Double Tongue High Top Chucks Inside patch view of a left tan and olive double tongue high top. 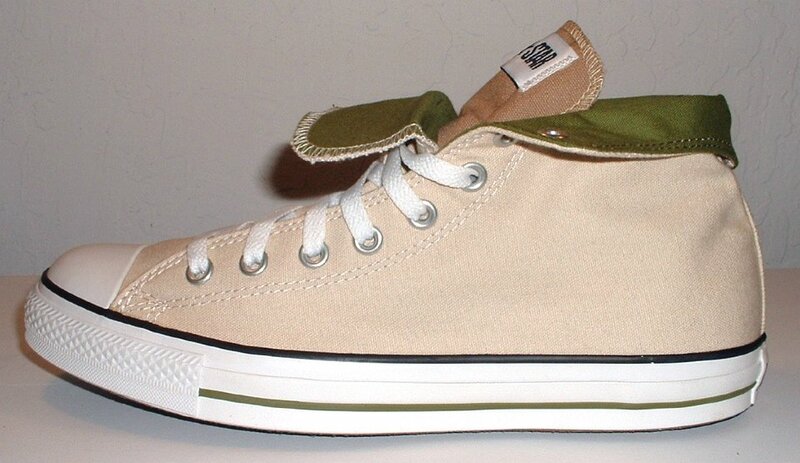 76 Double Tongue High Top Chucks Outside view of a left tan and olive double tongue high top. 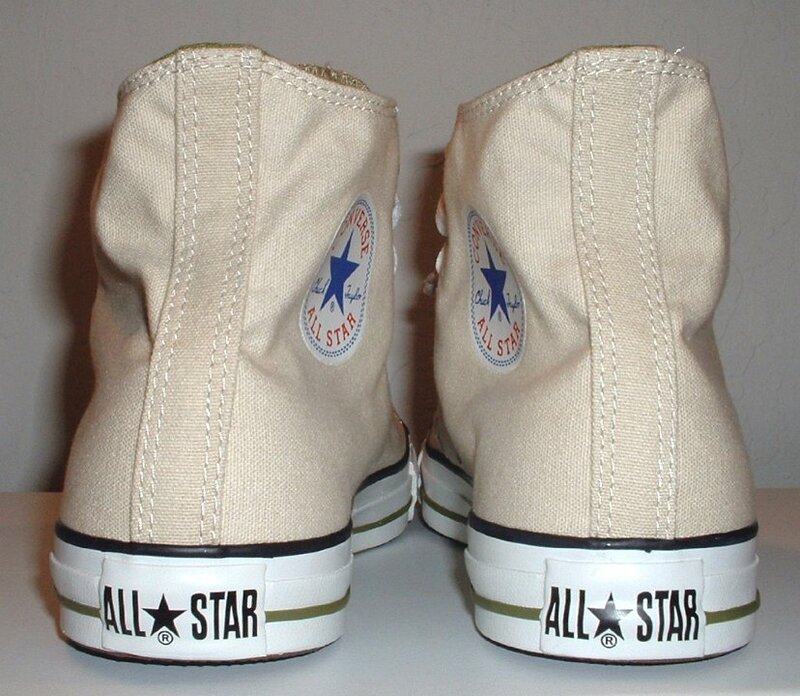 77 Double Tongue High Top Chucks Rear view of tan and olive double tongue high tops. 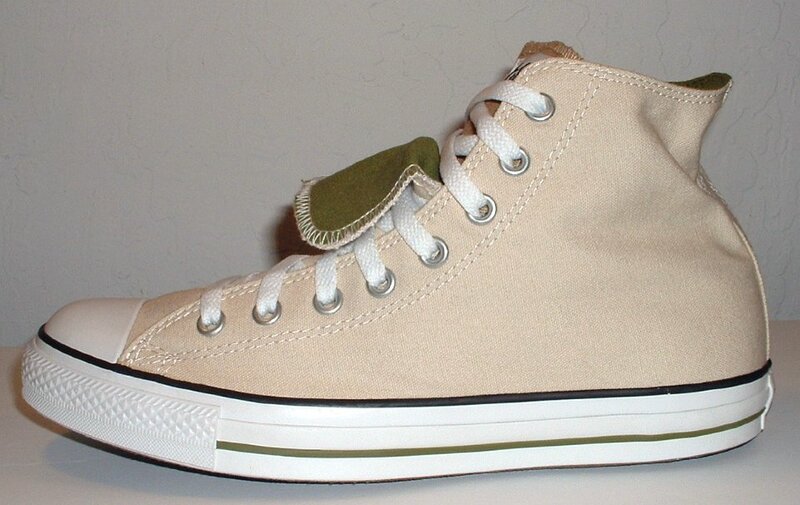 78 Double Tongue High Top Chucks Front view of tan and olive double tongue high tops. 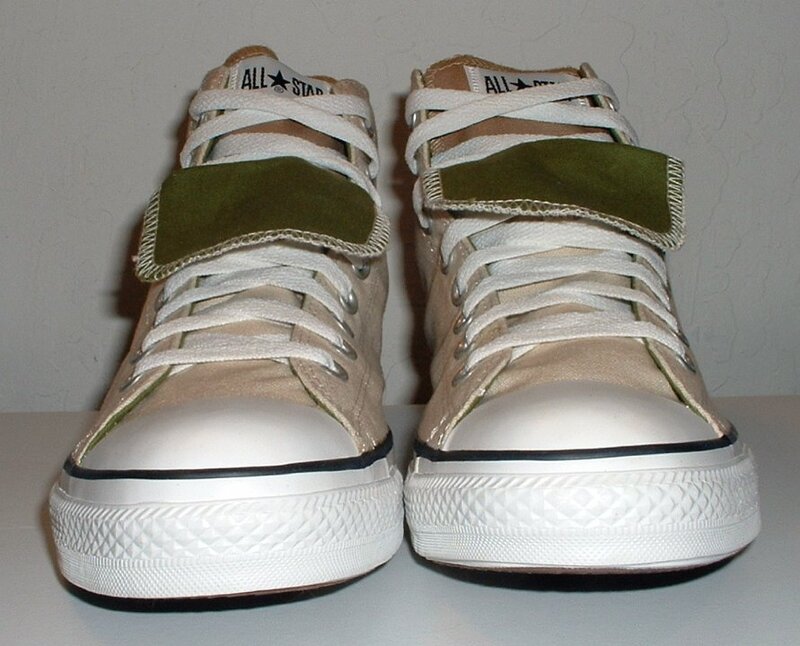 79 Double Tongue High Top Chucks Angled side view of tan and olive double tongue high tops. 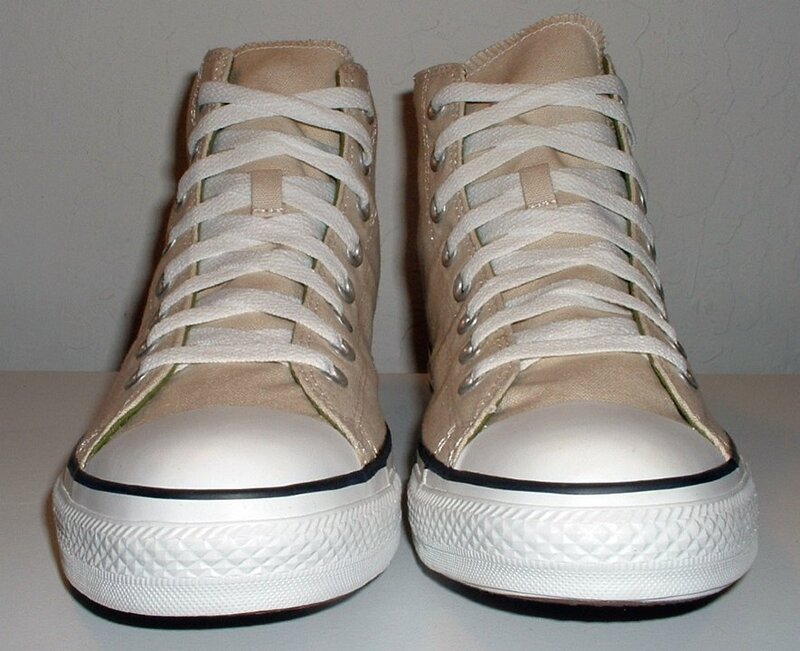 80 Double Tongue High Top Chucks Top view of tan and olive double tongue high tops. 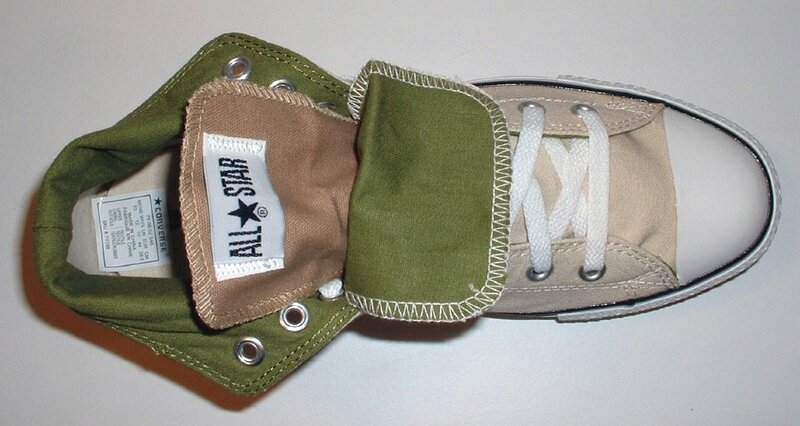 81 Double Tongue High Top Chucks Inside patch views of tan and olive double tongue high tops. 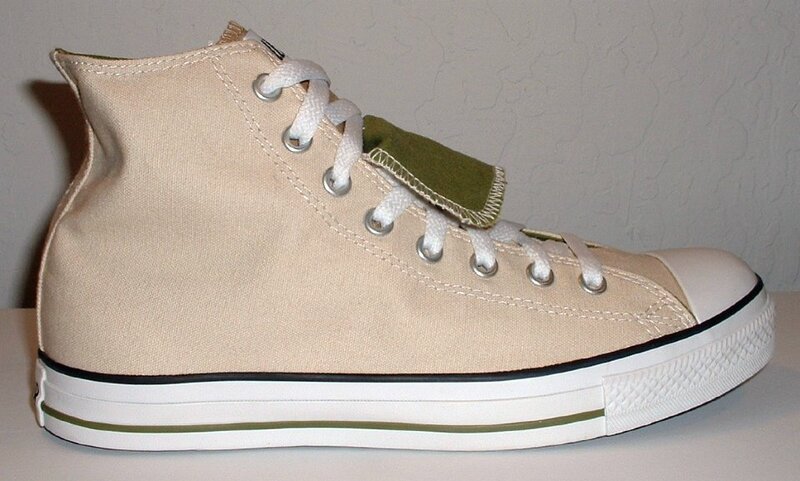 82 Double Tongue High Top Chucks Angled front view of tan and olive double tongue high tops. 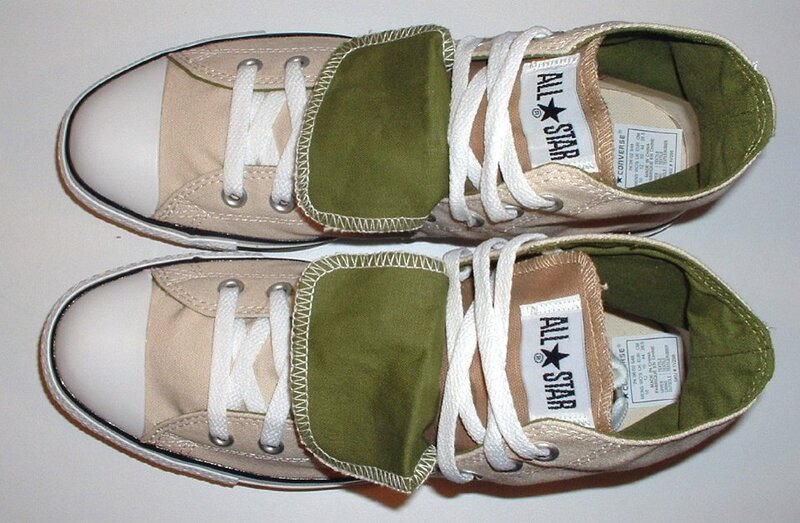 83 Double Tongue High Top Chucks Inside patch and sole views of tan and olive double tongue high tops. 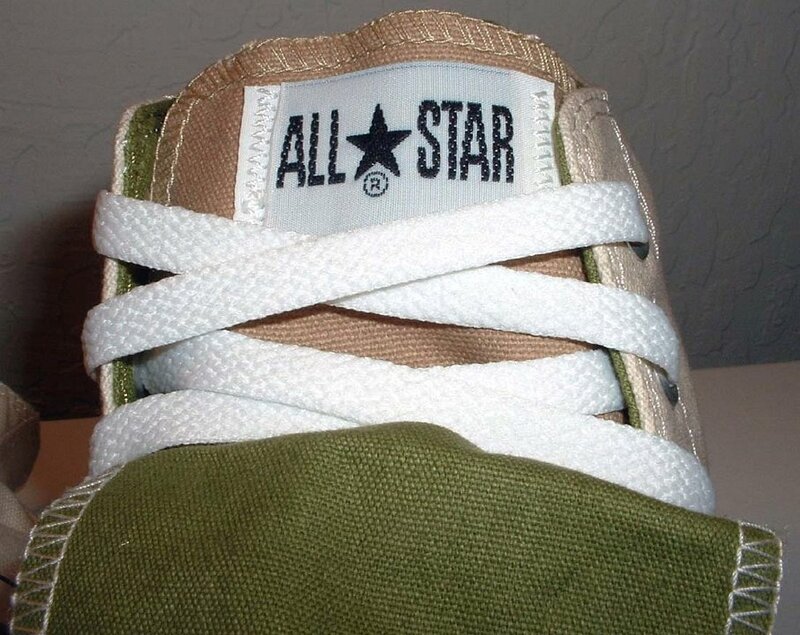 84 Double Tongue High Top Chucks Closeup view of the inner tongue and all star label on tan and olive double tongue high tops. 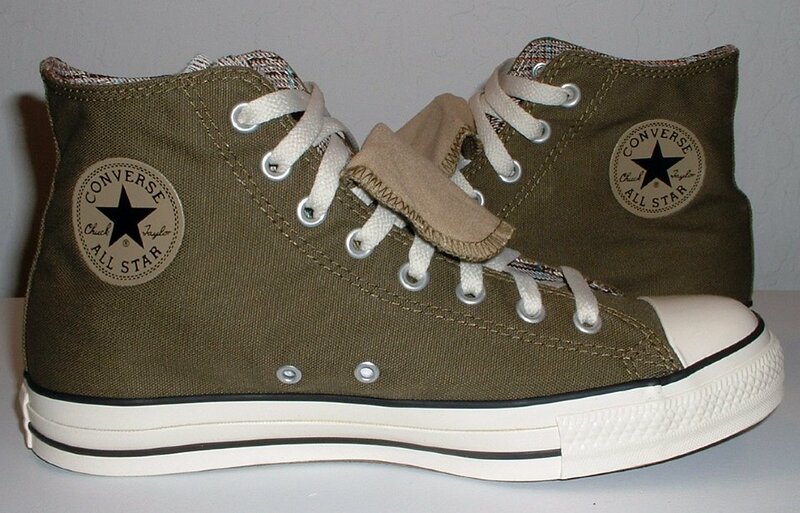 85 Double Tongue High Top Chucks Front view of tan and olive double tongue high tops with both tongues laced up. 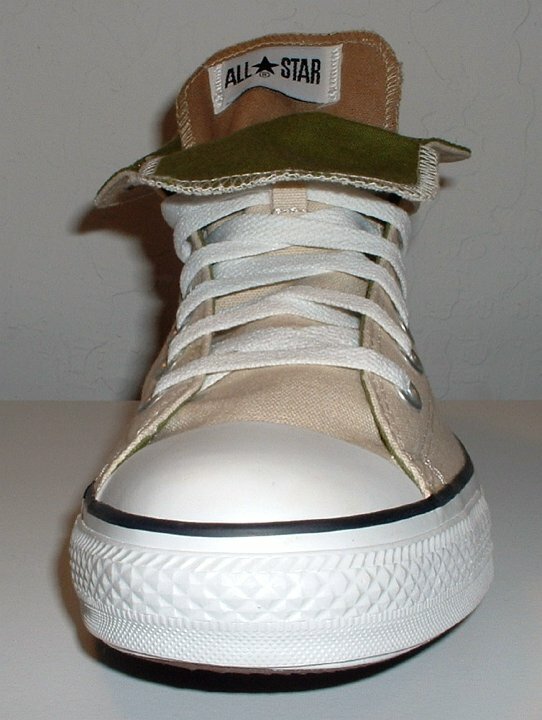 86 Double Tongue High Top Chucks Closeup top view of tan and olive double tongue high tops with both tongues laced up. 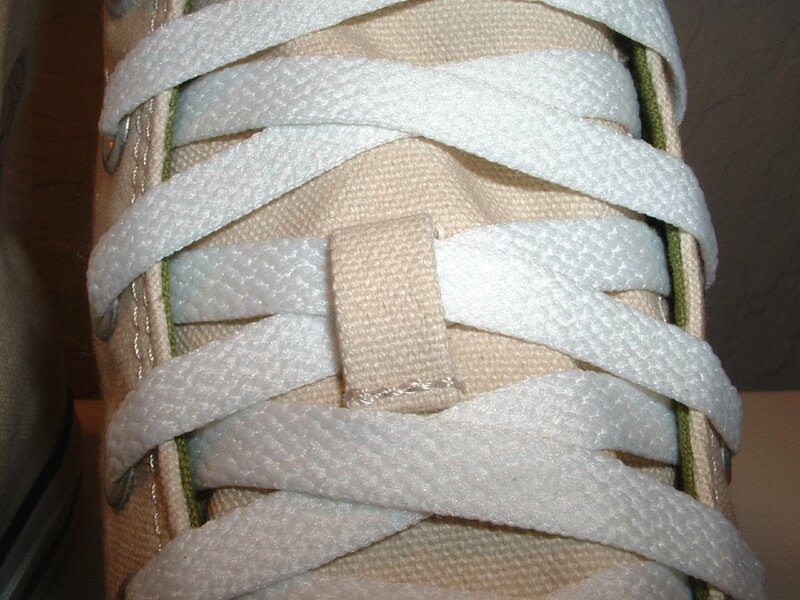 87 Double Tongue High Top Chucks Inside patch view of a rolled down left tan and olive double tongue high top. 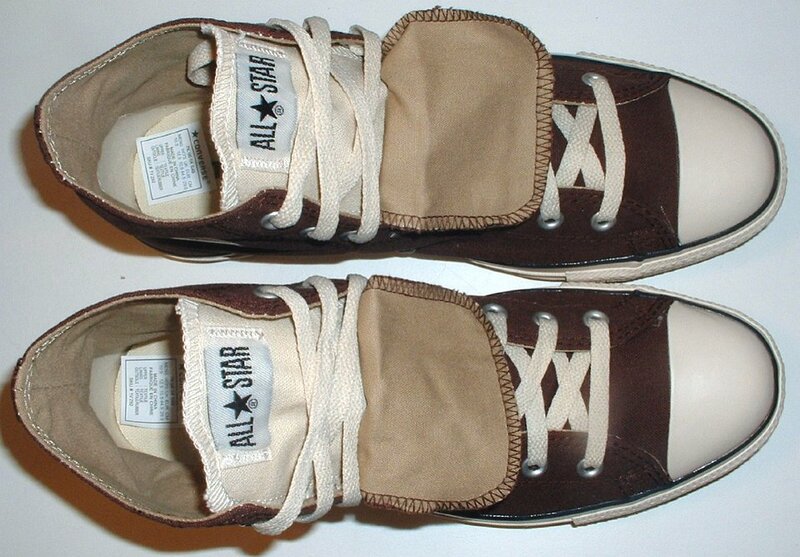 88 Double Tongue High Top Chucks Outside view of a rolled down left tan and olive double tongue high top. 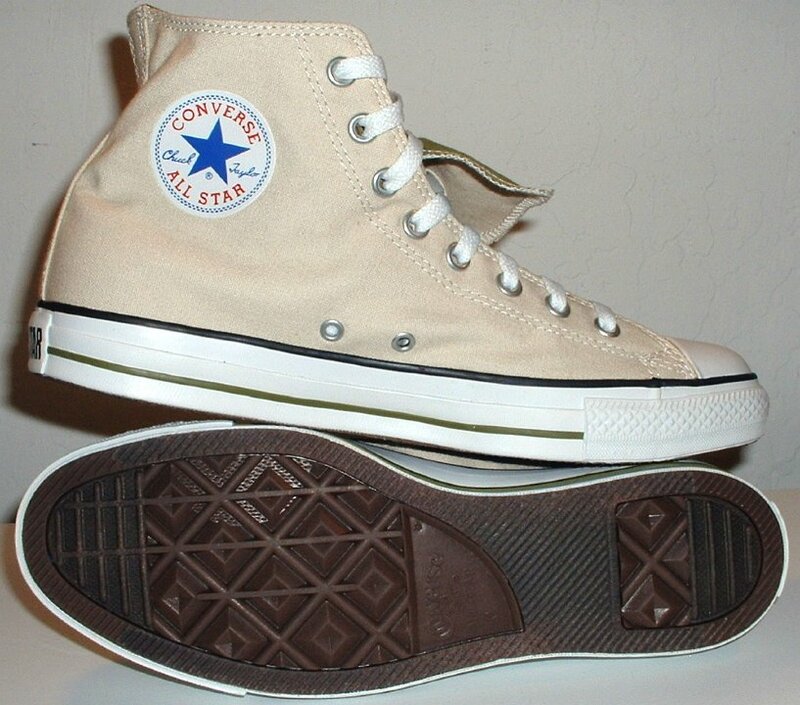 89 Double Tongue High Top Chucks Rear view of a rolled down left tan and olive double tongue high top. 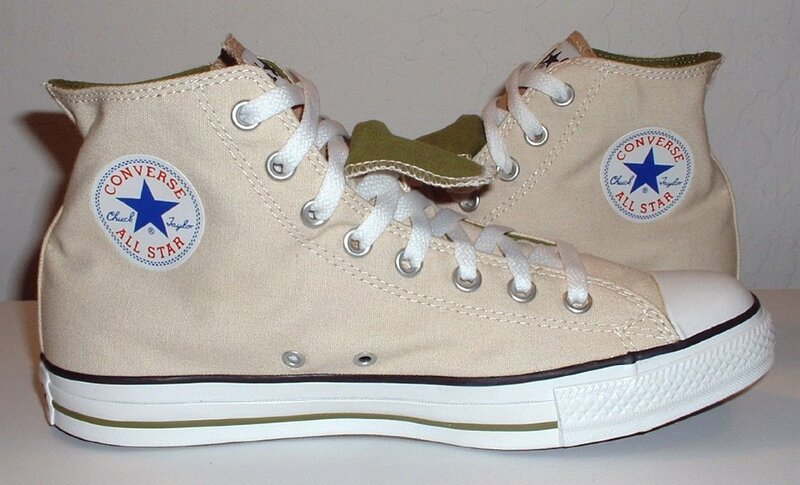 90 Double Tongue High Top Chucks Front view of a rolled down left tan and olive double tongue high top. 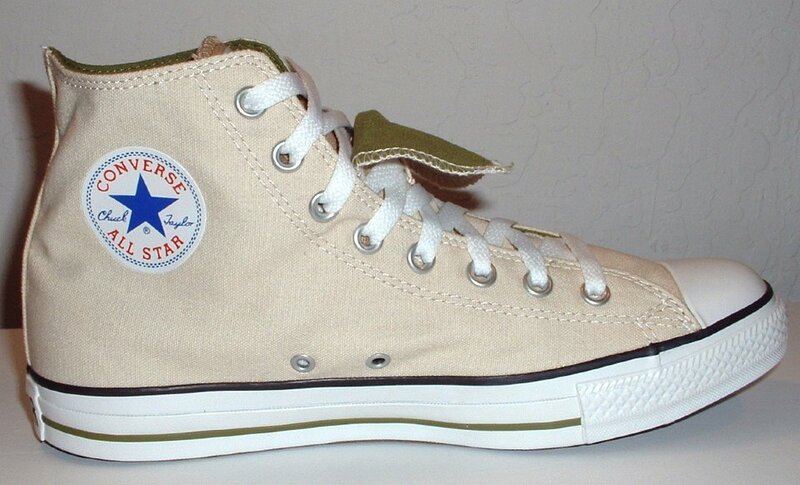 91 Double Tongue High Top Chucks Top view of a rolled down left tan and olive double tongue high top. 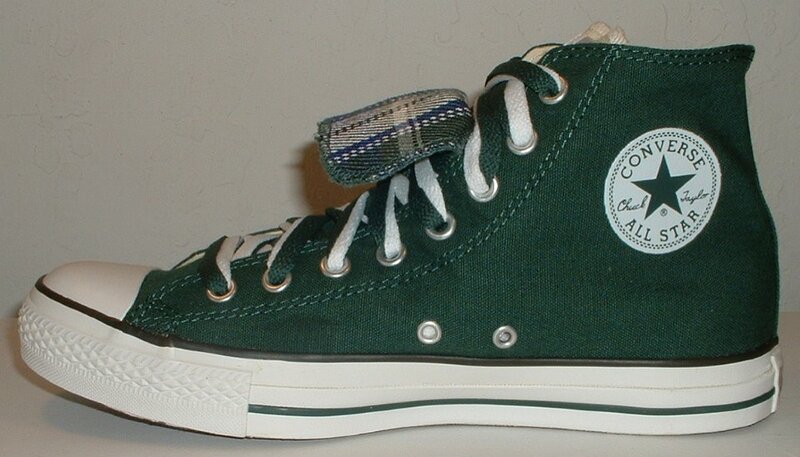 92 Double Tongue High Top Chucks Inside patch view of a right trekking green and plaid double tongue high top. 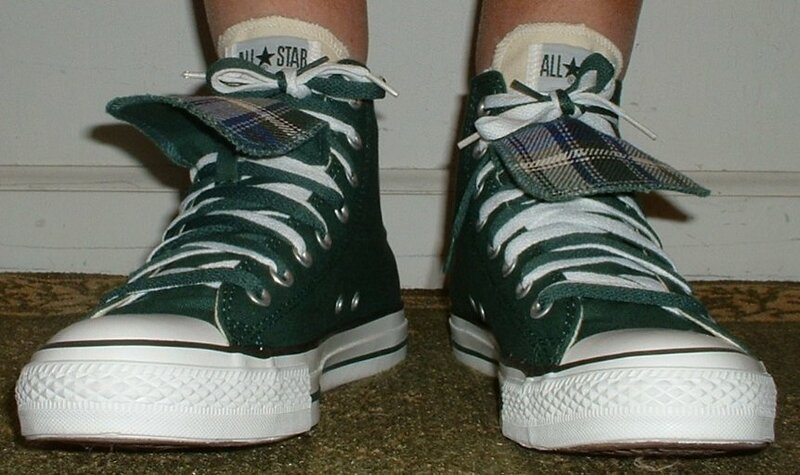 93 Double Tongue High Top Chucks Outside view of a right trekking green and plaid double tongue high top. 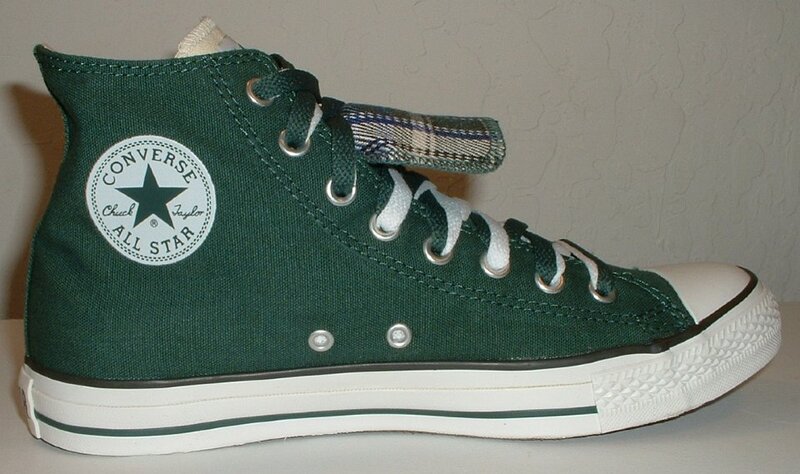 94 Double Tongue High Top Chucks Inside patch view of a left trekking green and plaid double tongue high top. 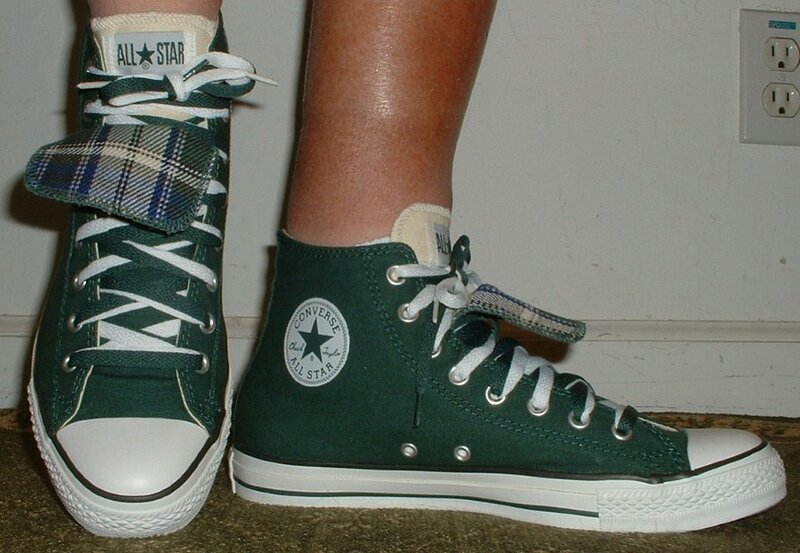 95 Double Tongue High Top Chucks Outside view of a left trekking green and plaid double tongue high top. 96 Double Tongue High Top Chucks Rear view of trekking green and plaid double tongue high tops. 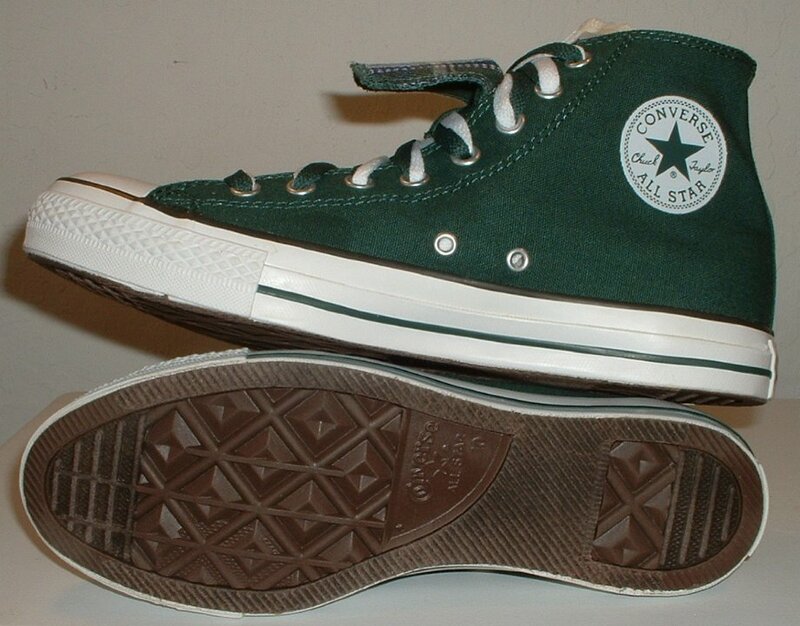 97 Double Tongue High Top Chucks Angled rear view of trekking green and plaid double tongue high tops. 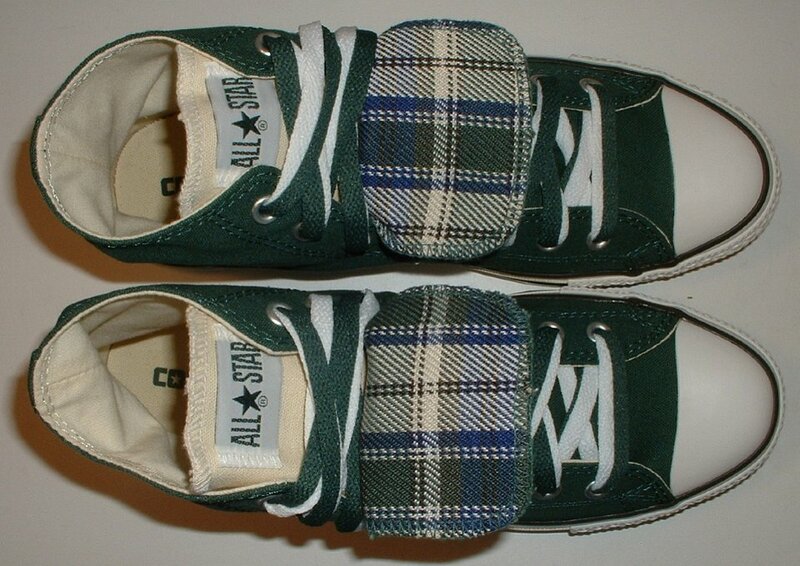 98 Double Tongue High Top Chucks Angled side view of trekking green and plaid double tongue high tops. 99 Double Tongue High Top Chucks Front view of trekking green and plaid double tongue high tops. 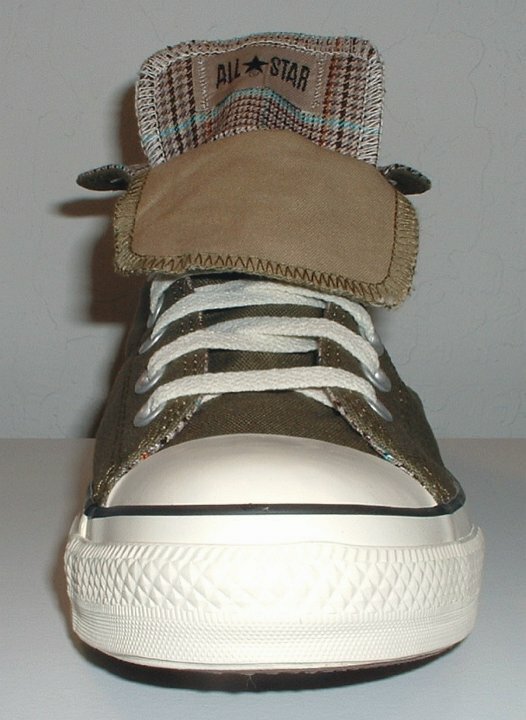 100 Double Tongue High Top Chucks Angled front view of trekking green and plaid double tongue high tops. 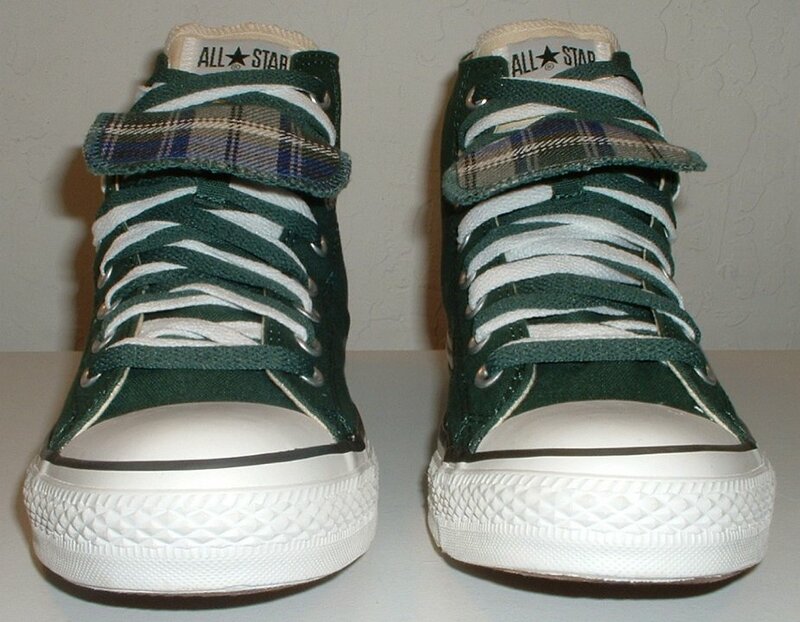 101 Double Tongue High Top Chucks Top view of trekking green and plaid double tongue high tops. 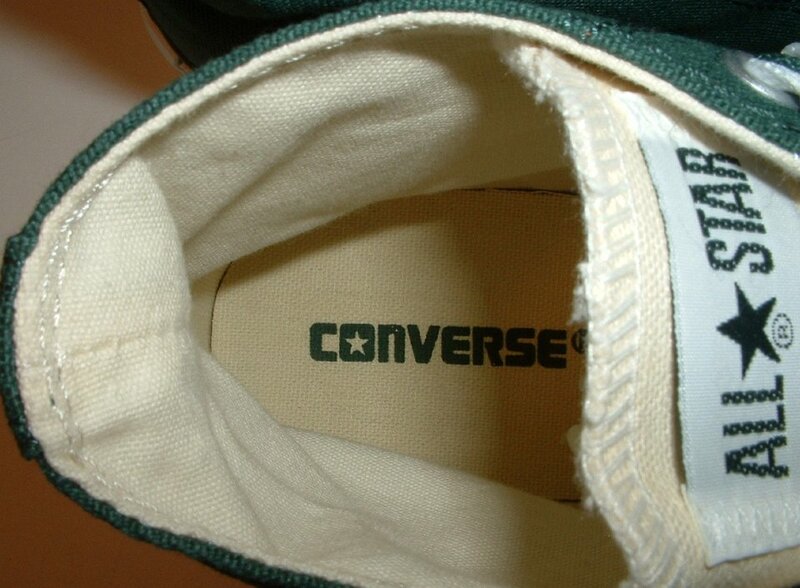 102 Double Tongue High Top Chucks Closeup of the insole of a trekking green and plaid double tongue high top. 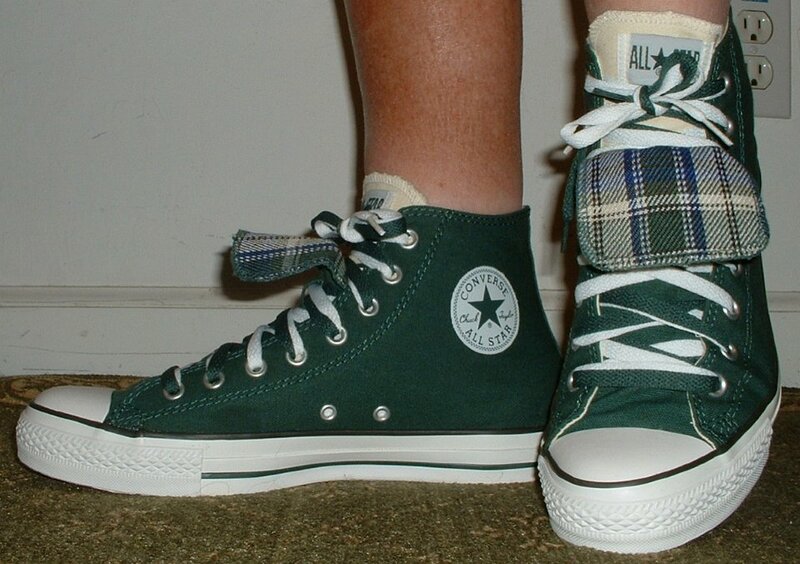 103 Double Tongue High Top Chucks Inside patch views of trekking green and plaid double tongue high tops. 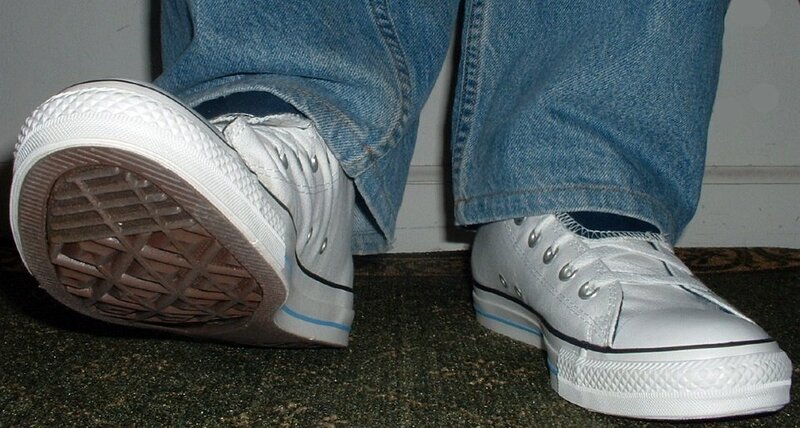 104 Double Tongue High Top Chucks Outside views of trekking green and plaid double tongue high tops. 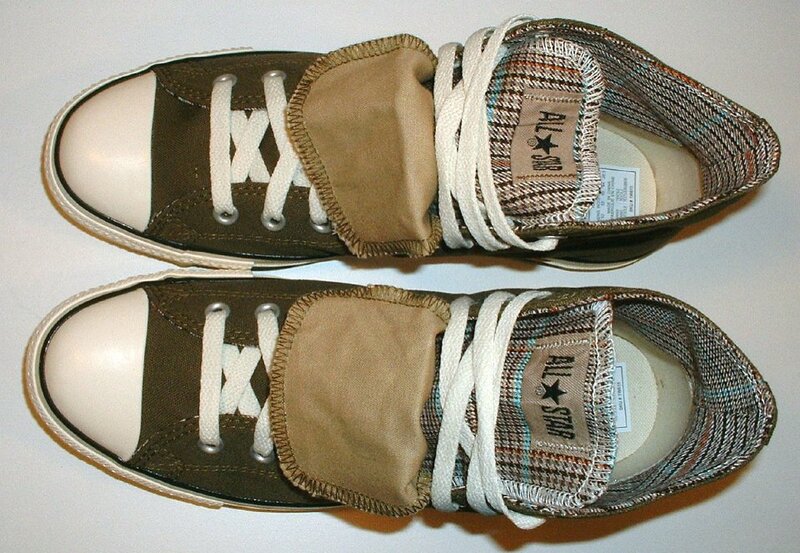 105 Double Tongue High Top Chucks Inside patch and sole views of trekking green and plaid double tongue high tops. 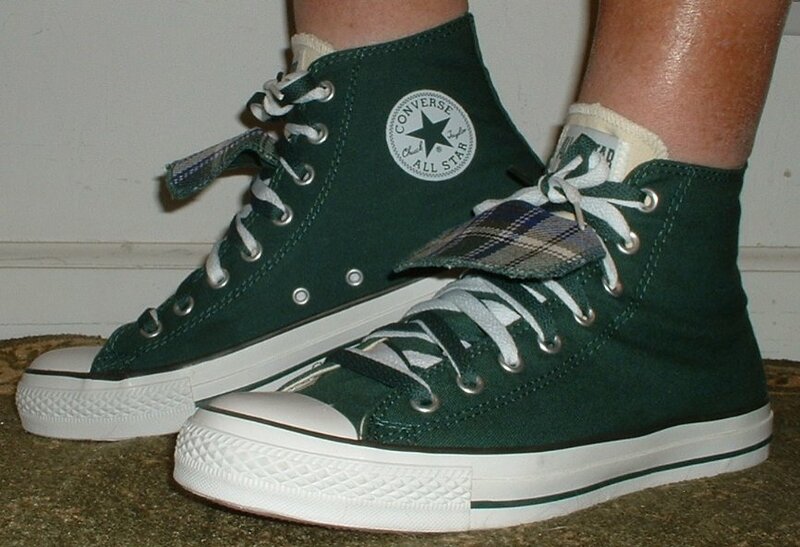 106 Double Tongue High Top Chucks Wearing trekking green and plaid double tongue high tops, front view 1. 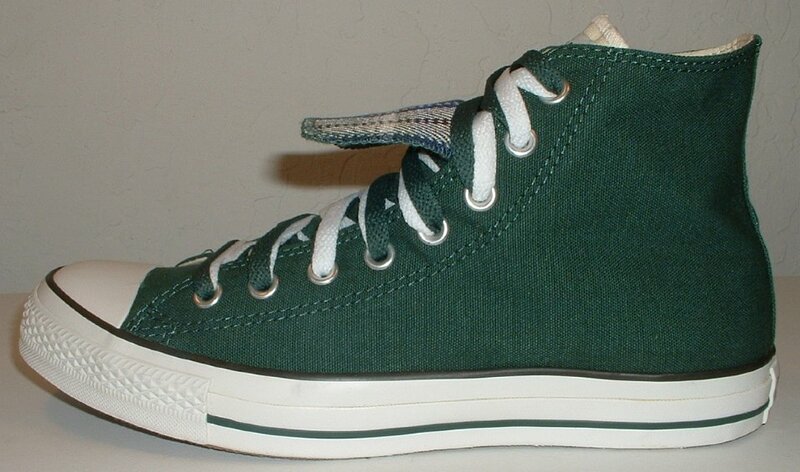 107 Double Tongue High Top Chucks Wearing trekking green and plaid double tongue high tops, front view 2. 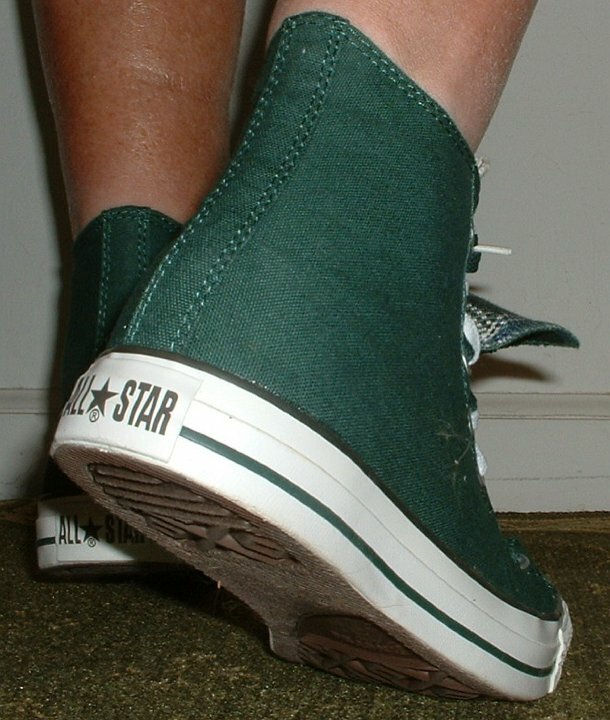 108 Double Tongue High Top Chucks Wearing trekking green and plaid double tongue high tops, front view 3. 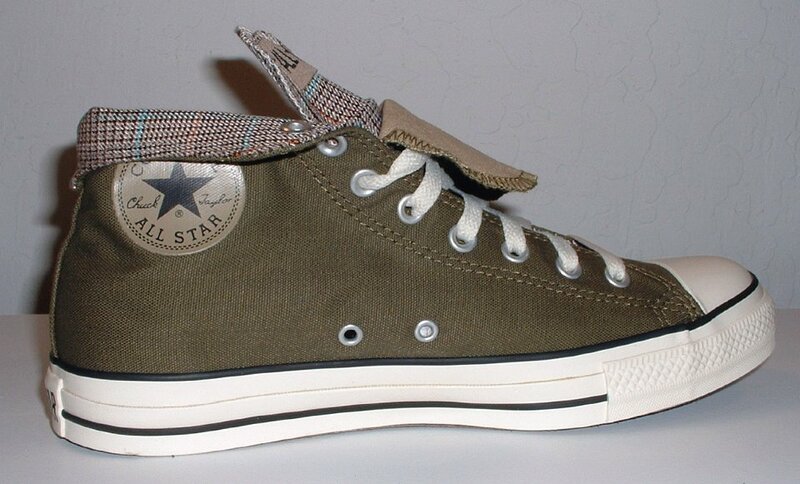 109 Double Tongue High Top Chucks Wearing trekking green and plaid double tongue high tops, left side view 1. 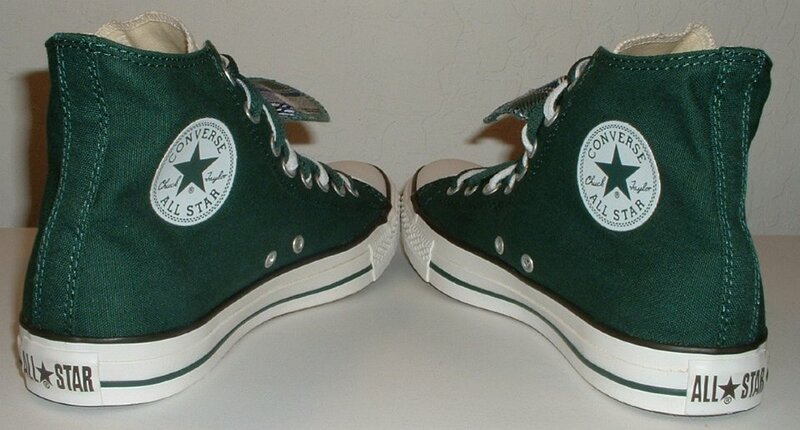 110 Double Tongue High Top Chucks Wearing trekking green and plaid double tongue high tops, left side view 2. 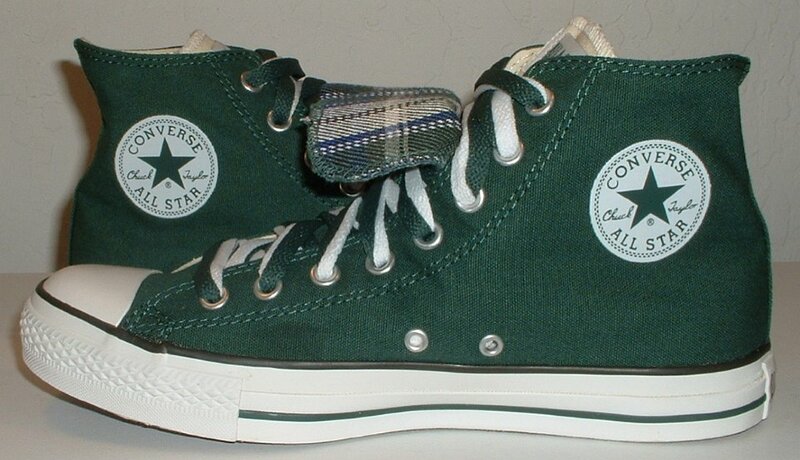 111 Double Tongue High Top Chucks Wearing trekking green and plaid double tongue high tops, rear view 1. 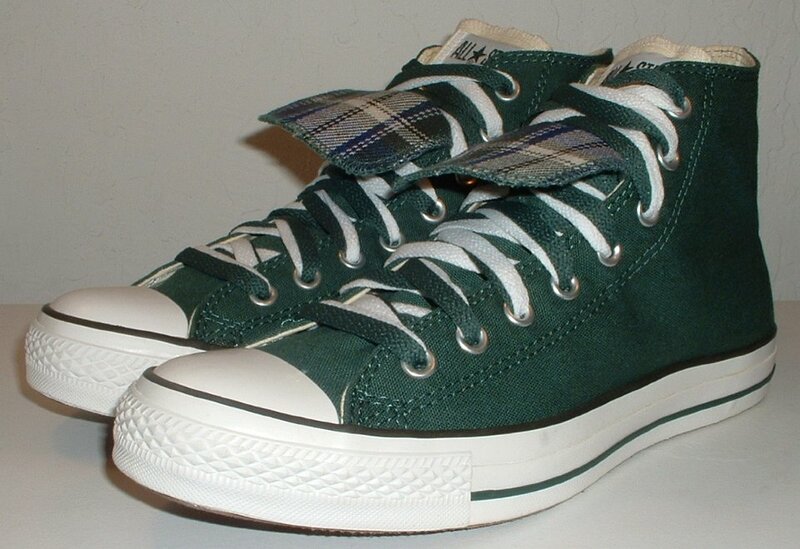 112 Double Tongue High Top Chucks Wearing trekking green and plaid double tongue high tops, rear view 2. 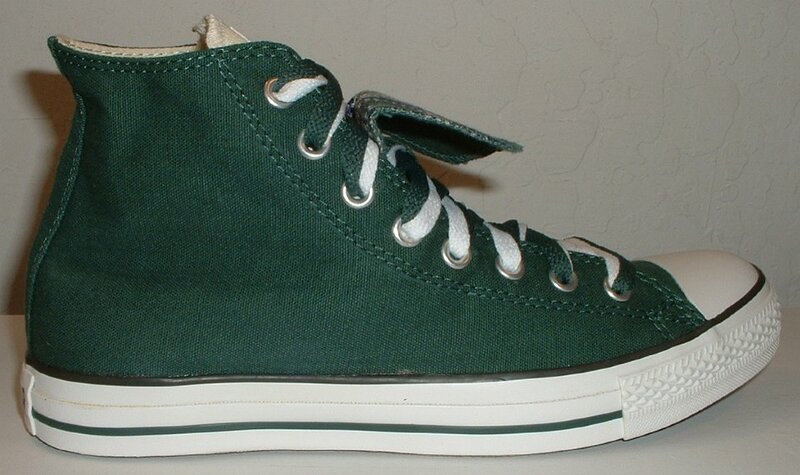 113 Double Tongue High Top Chucks Wearing trekking green and plaid double tongue high tops, right side view 1. 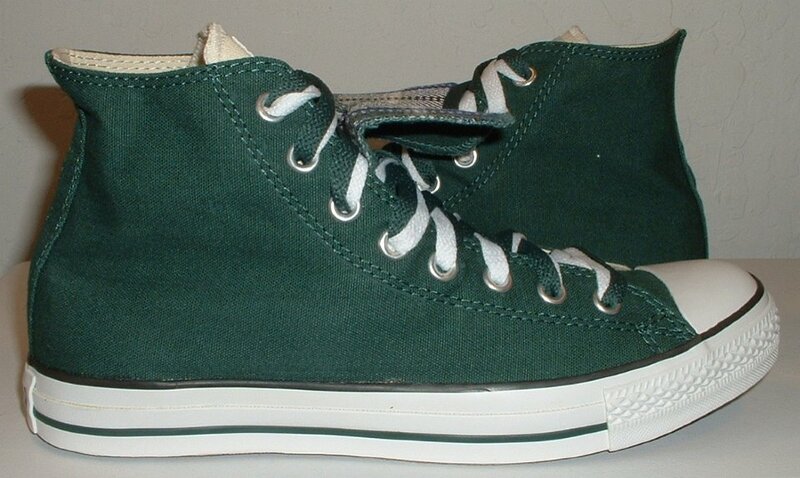 114 Double Tongue High Top Chucks Wearing trekking green and plaid double tongue high tops, right side view 2. 115 Double Tongue High Top Chucks Inside patch view of a right white and blue double tongue high top. 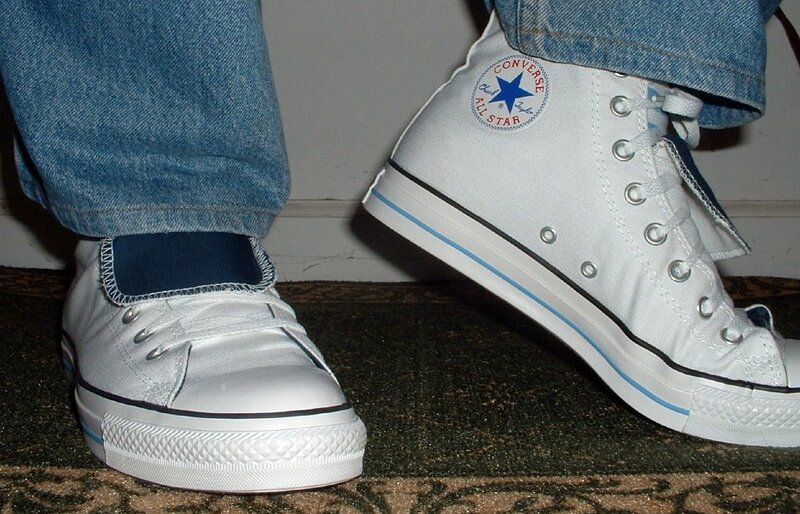 116 Double Tongue High Top Chucks Outside view of a right white and blue double tongue high top. 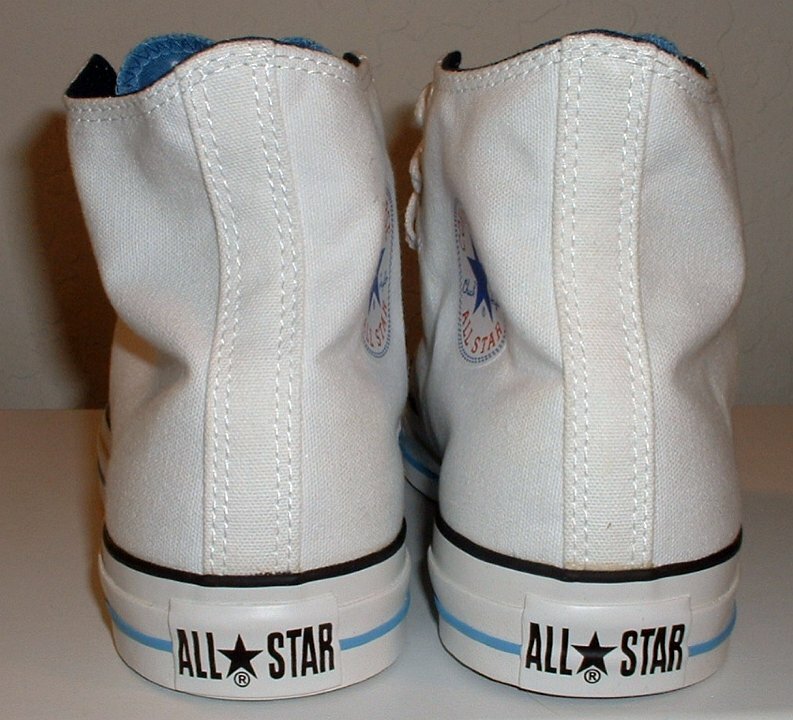 117 Double Tongue High Top Chucks Outside view of a left white and blue double tongue high top. 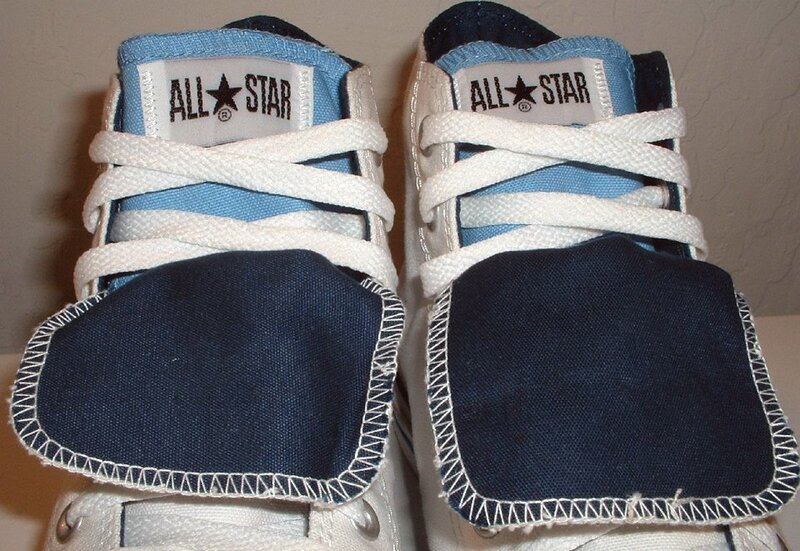 118 Double Tongue High Top Chucks Inside patch view of a left white and blue double tongue high top. 119 Double Tongue High Top Chucks Front view of white and blue double tongue high tops. 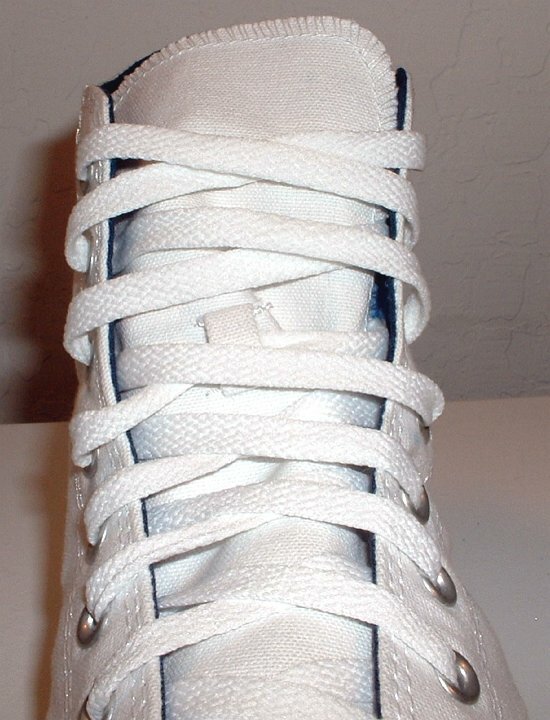 120 Double Tongue High Top Chucks Closeup top view of white and blue double tongue high tops. 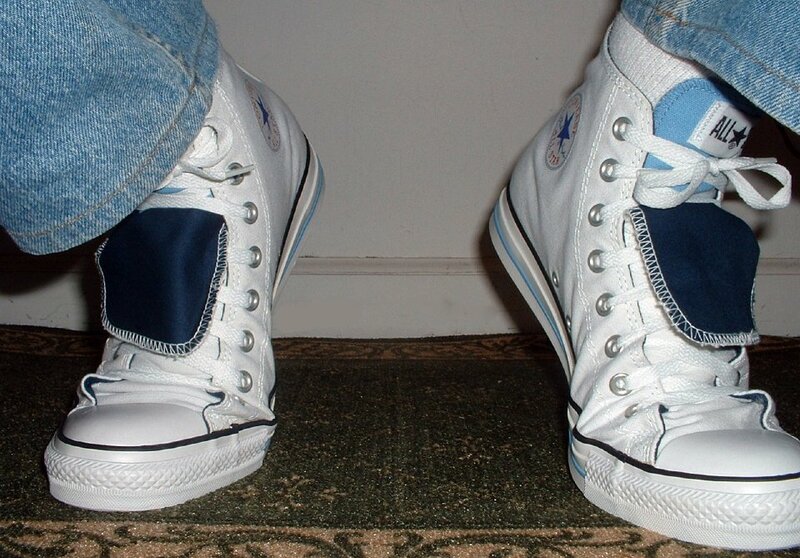 121 Double Tongue High Top Chucks Top view of white and blue double tongue high tops. 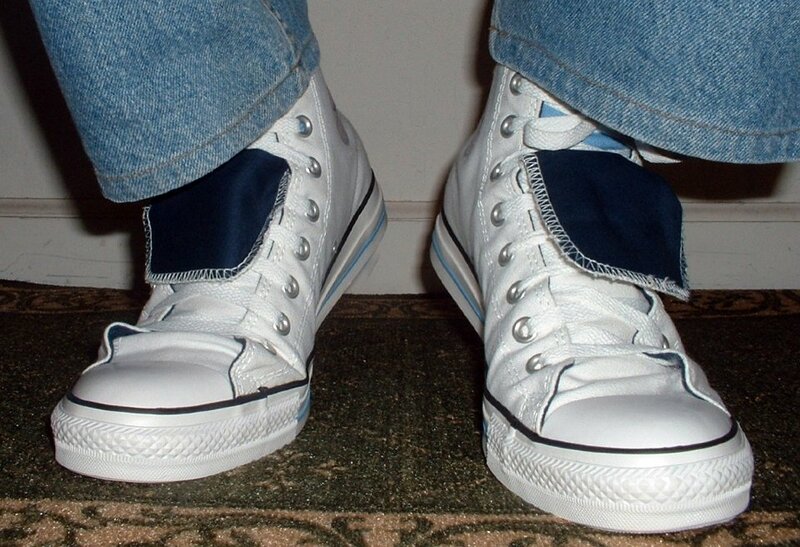 122 Double Tongue High Top Chucks Rear view of white and blue double tongue high tops. 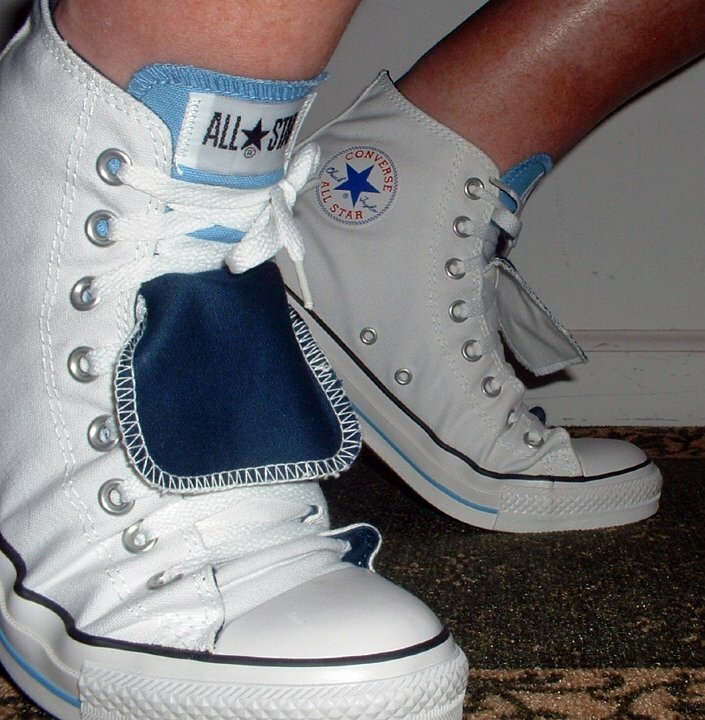 123 Double Tongue High Top Chucks Inside patch views of white and blue double tongue high tops. 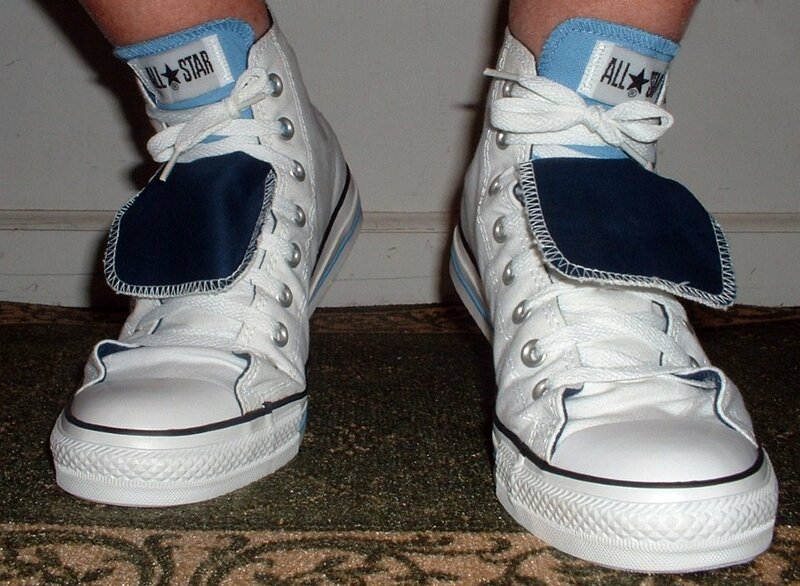 124 Double Tongue High Top Chucks Angled front view of white and blue double tongue high tops. 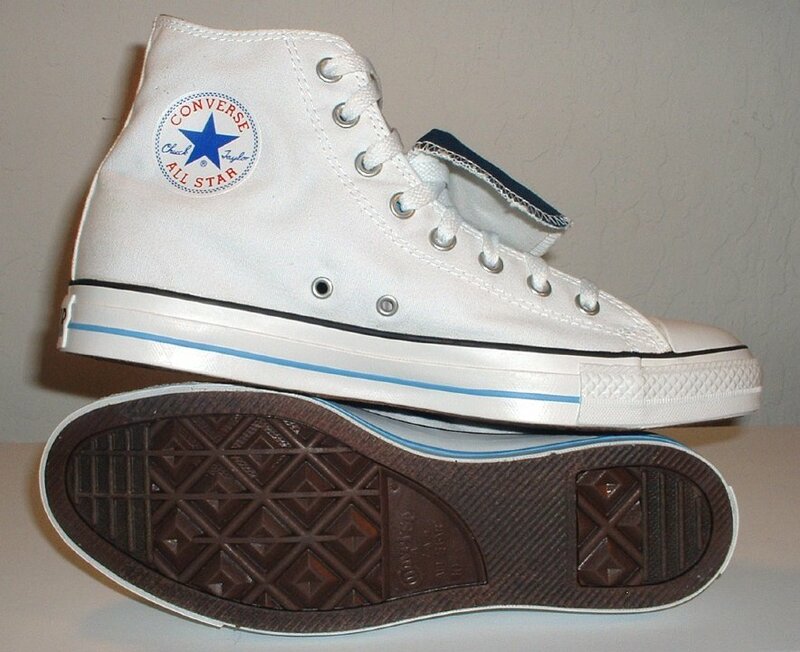 125 Double Tongue High Top Chucks Inside patch and sole views of white and blue double tongue high tops. 126 Double Tongue High Top Chucks Closeup top view of a left white and blue double tongue high top with both tongues laced up. 127 Double Tongue High Top Chucks Inside patch view of a left white and blue double tongue high top with both tongues laced up. 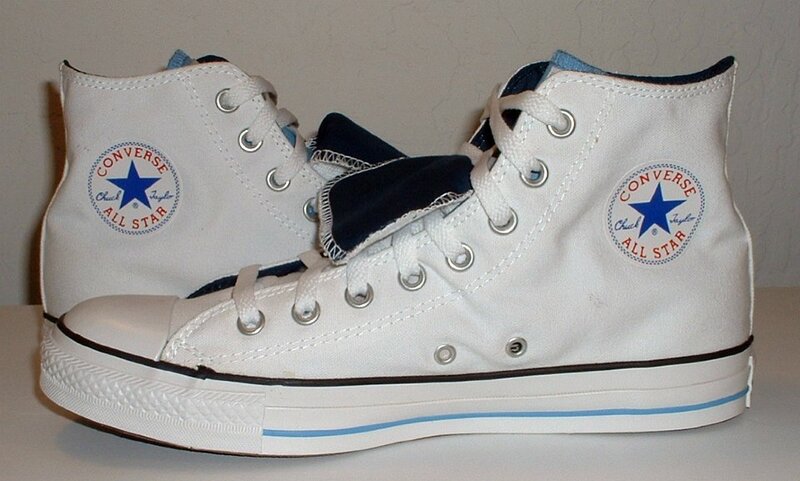 128 Double Tongue High Top Chucks Wearing white and blue double tongue high tops, front view 1. 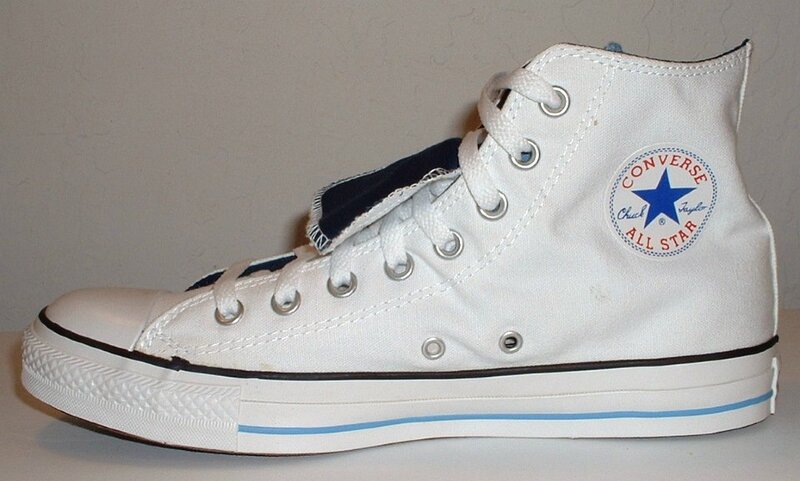 129 Double Tongue High Top Chucks Stepping out in white and blue double tongue high tops, front view 2. 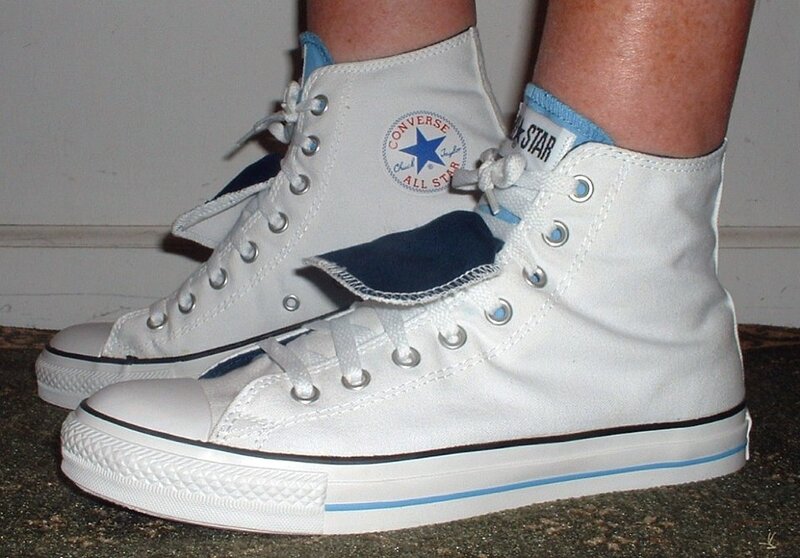 130 Double Tongue High Top Chucks Stepping out in white and blue double tongue high tops, front view 3. 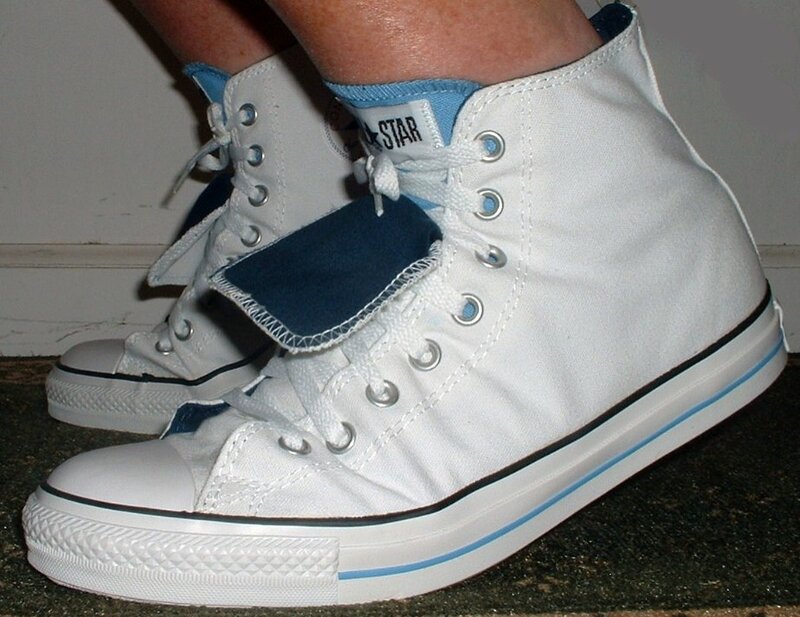 131 Double Tongue High Top Chucks Wearing white and blue double tongue high tops, side view. 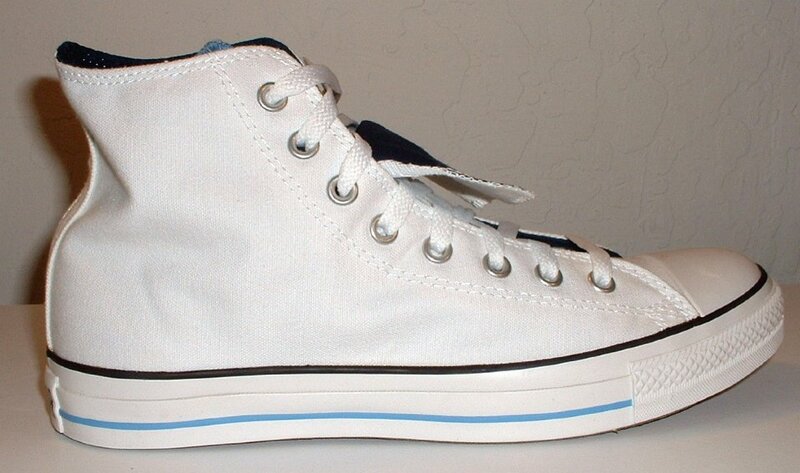 132 Double Tongue High Top Chucks Stepping up in white and blue double tongue high tops, front view. 133 Double Tongue High Top Chucks Wearing white and blue double tongue high tops, angled front and inside patch views. 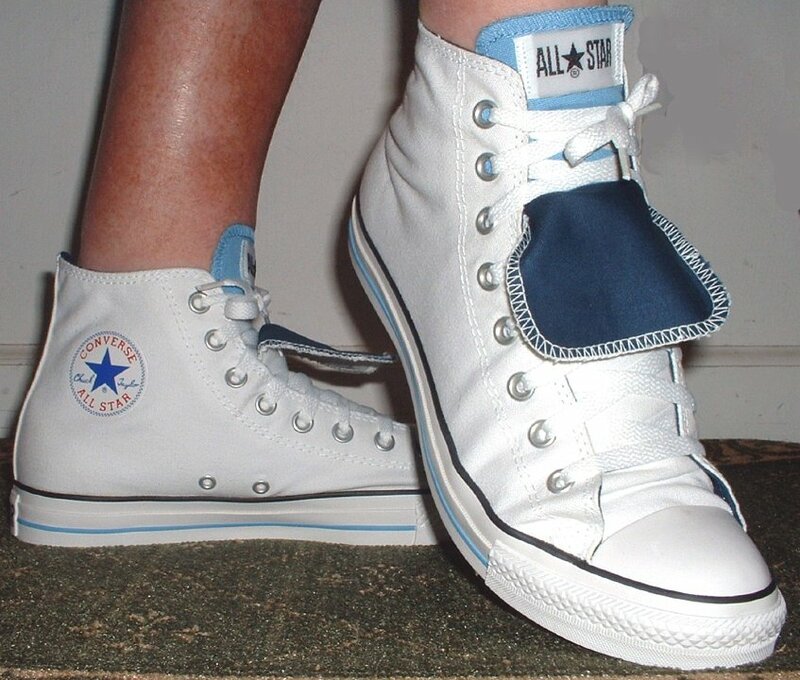 134 Double Tongue High Top Chucks Stepping out in white and blue double tongue high tops, side view. 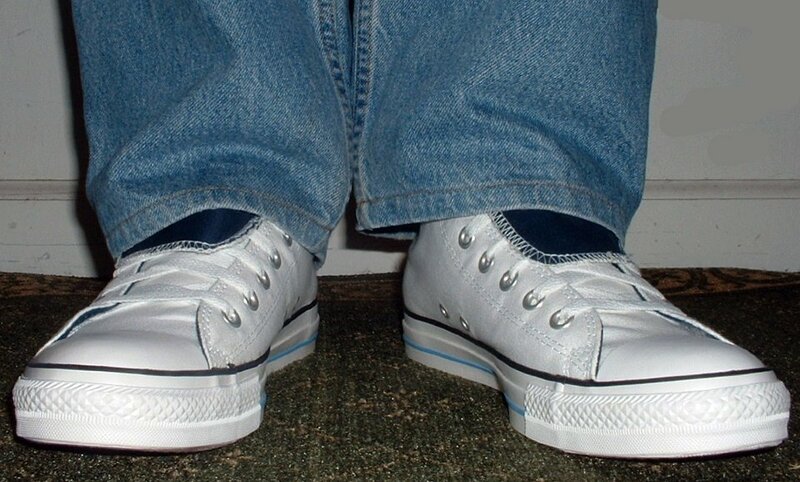 135 Double Tongue High Top Chucks Stepping up in white and blue double tongue high tops, rear view. 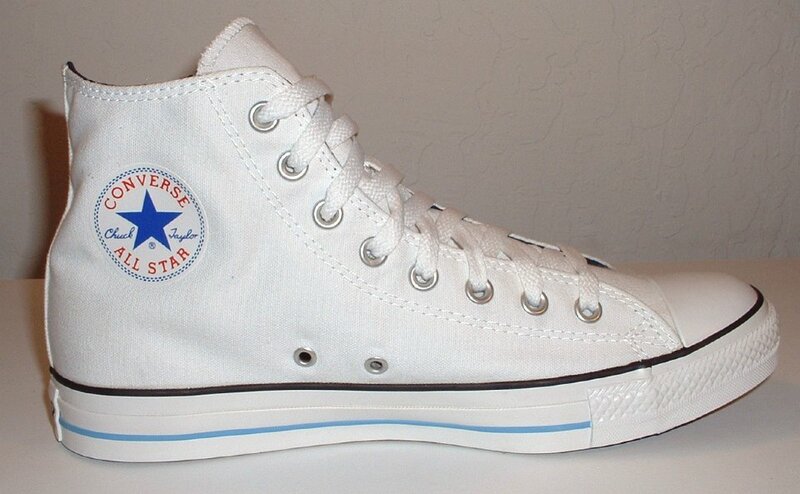 136 Double Tongue High Top Chucks Stepping up in white and blue double tongue high tops, side view. 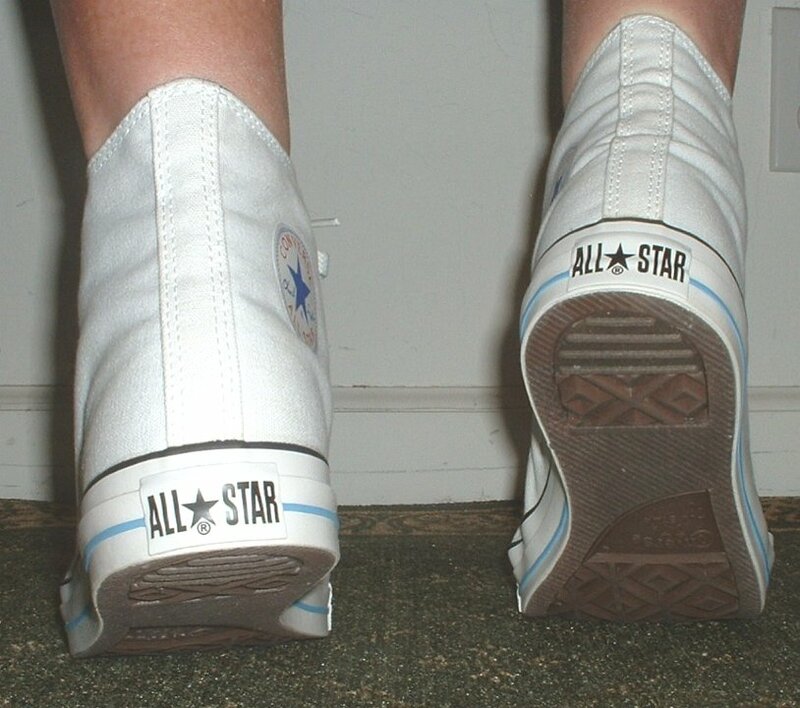 137 Double Tongue High Top Chucks Wearing white and blue double tongue high tops, front view. 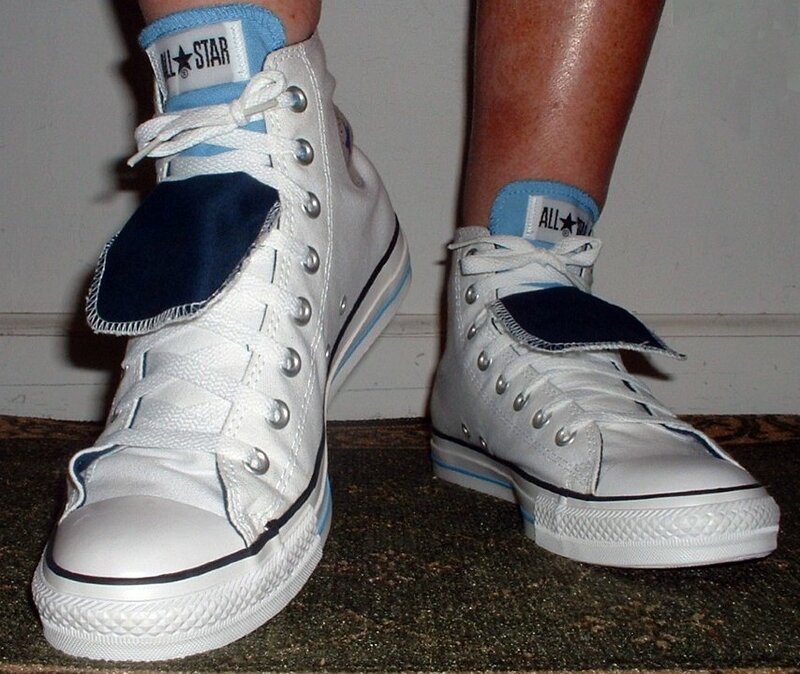 138 Double Tongue High Top Chucks Stepping out in white and blue double tongue high tops, front view. 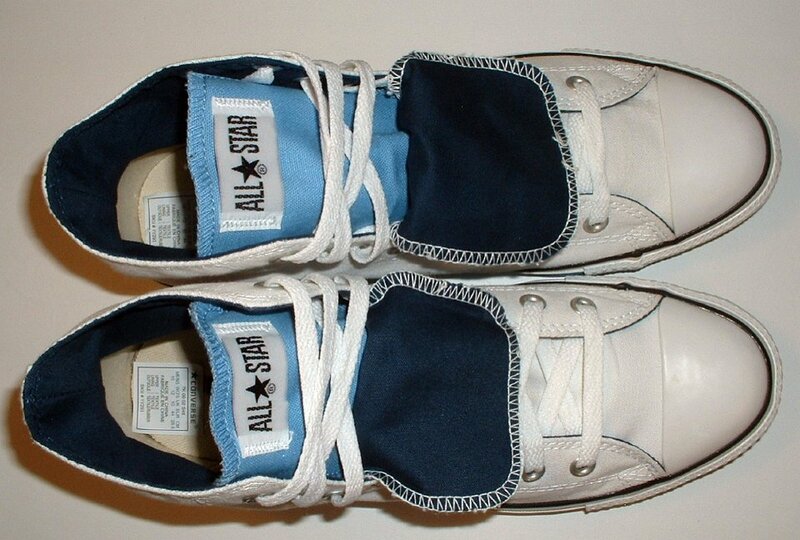 139 Double Tongue High Top Chucks Stepping up in white and blue double tongue high tops, front view. 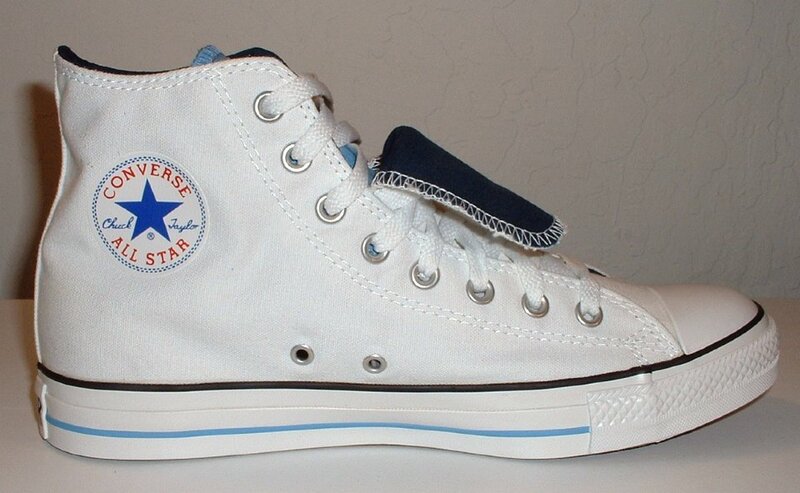 140 Double Tongue High Top Chucks Wearing white and blue double tongue high tops, front and inside patch views. 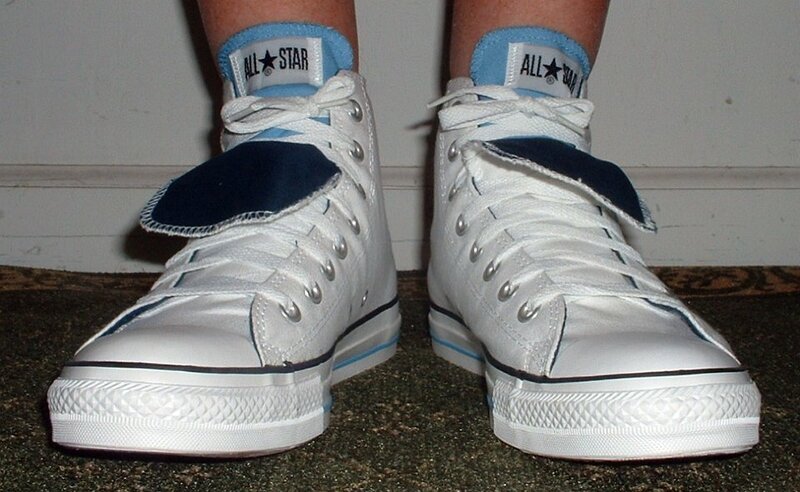 141 Double Tongue High Top Chucks Stepping out in white and blue double tongue high tops, angled front view. 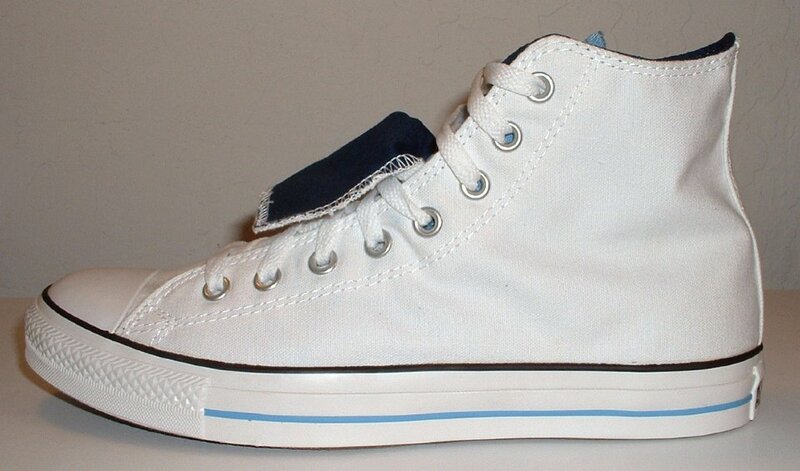 142 Double Tongue High Top Chucks Stepping up in white and blue double tongue high tops, front view. 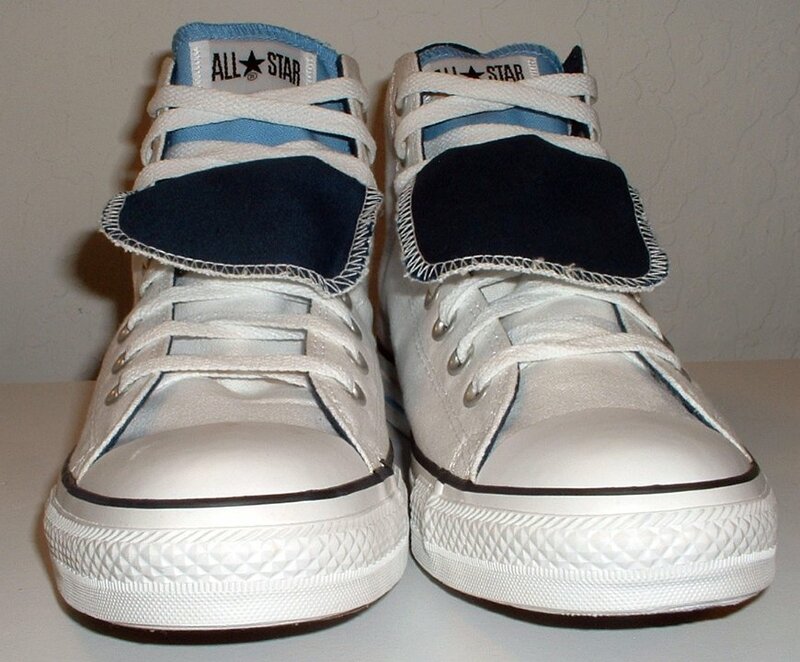 143 Double Tongue High Top Chucks Stepping up in white and blue double tongue high tops, angled front view. 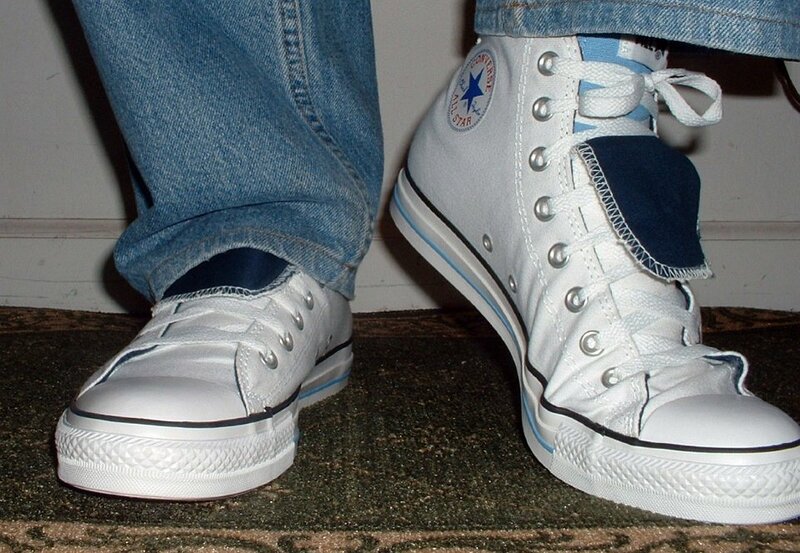 Double tongue high top chucks were first released in 2006. 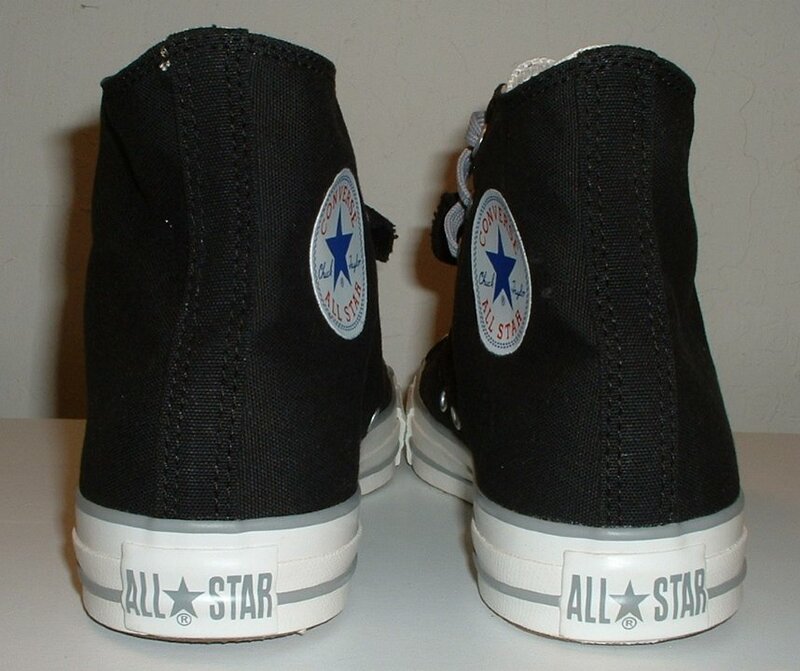 They have two tongues built into each shoe, one that can be laced up that has a rectangle All Star patch sewn on it, and a top tongue that is meant to be worn folded down. 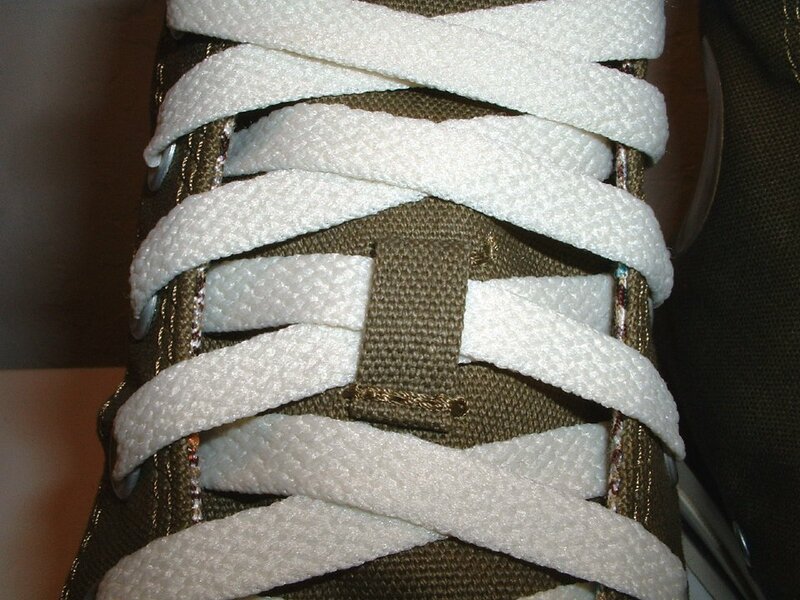 The shoes come with two lengths of laces and there is a shoelace slot in the upper tongue to help hold it in place. The shoes have a main outside color and two matching inner colors (like navy and light blue) on the inside and second tongue. 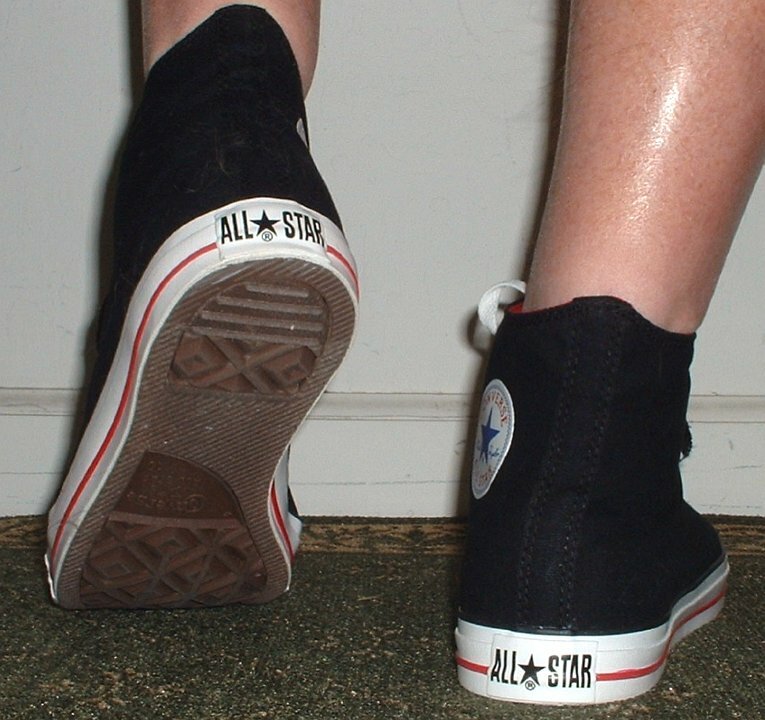 The shoes can be worn as regular high tops with both tongues laced up, or with one tongue folded over, or rolled down. 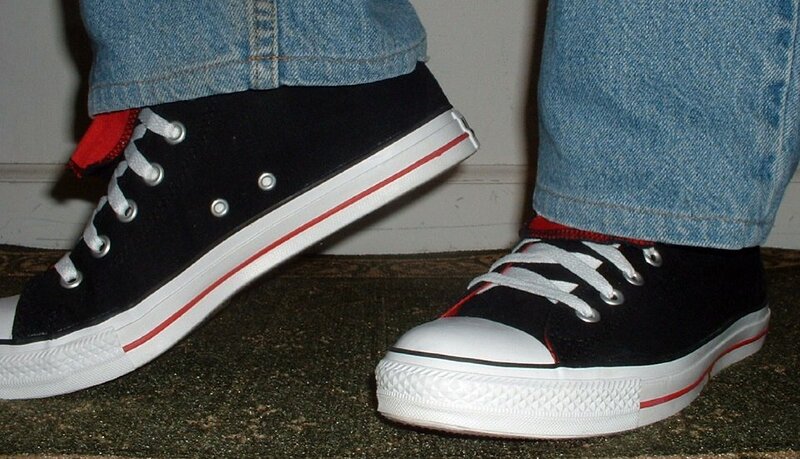 Double tongue chucks are also made in some low cut models.